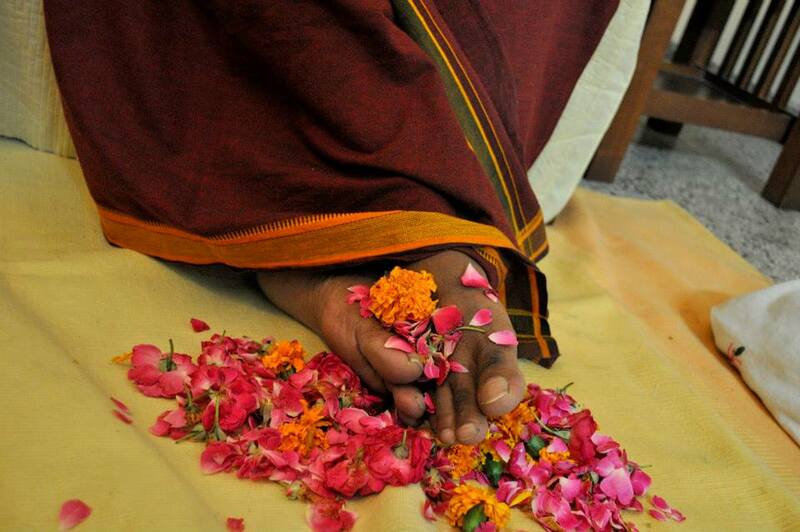 This is an experience of a staunch devotee, Bharti Kapoor who lives in New Delhi. She saw Mohanji’s physical form there, though Mohanji is still in the USA. True masters can happen at many places at the same time. They are not limited by location. Their compassion manifests everywhere. One’s deep faith, connection and surrender make it recognisable and aware how their grace is tangible for all beings. This is her writing to Mohanji after the experience which she shares with all of you. We all read, we try to understand, we try to explain, we try to know realities using our own limited faculties. But a single minute of true experience teaches us more than millions of words and hundreds of explanations. It blows us off. It makes us awake. The normal human condition is a state filled with doubts, apprehensions, fears, and the so-called conditional faith, making ourselves and others believe that I surrender to my Master, but yet still holding back some percentage of ourselves. Total surrender never happens in reality. Divine experience is always different with every soul. It solely depends on our receptivity, capacity as well as your faith in our Master. When we truly have an experience and decide to bring our experience into words, it transcends our level of being. When we surrender, only then our masters do appear, we can feel them, and sometimes touch them, too, even if they are far away in the physical realm. I had such an experience. A true miracle beyond comprehension. 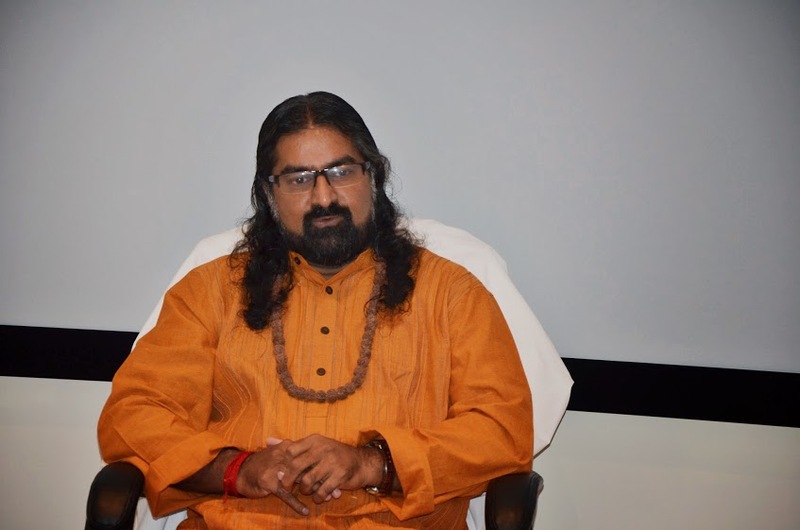 This experience has made my faith so strong that being an ardent follower of Shri Krishna, I, with all the grace of Para Brahma, I strongly believe in NOW, and my soul-felt gratitude to my Master Mohanji (name of Lord Shri Krishna) constantly guiding me to the gateway to the supreme consciousness. All incarnations and Masters came and merged into the white light but, who exists NOW is the only eternal truth our Mohanji! 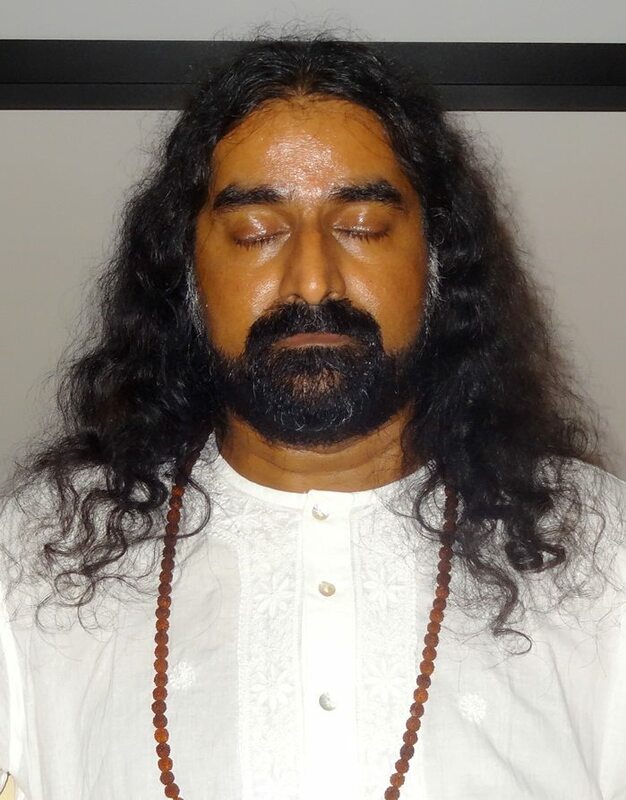 I want to share my experience my beloved family members, every day while driving back from my son’s school , I am in the most blissful state, listening to chants and chanting, connected to my own self. Just the other day, standing on the traffic red light, saw Facebook update reading Mohanji’s updated status and I had a big broad smile as always. It was 7. 20am on the 27th August. As I started to drive, from a distance I saw a gentleman with white attire, right in the middle of the road bending to pick up something. Usually, while driving alone, I do not stop and pass by any such situation, but as I was drawing more closer to the place of the incident, I parked my car, and moved towards him, feeling as someone very known to me. 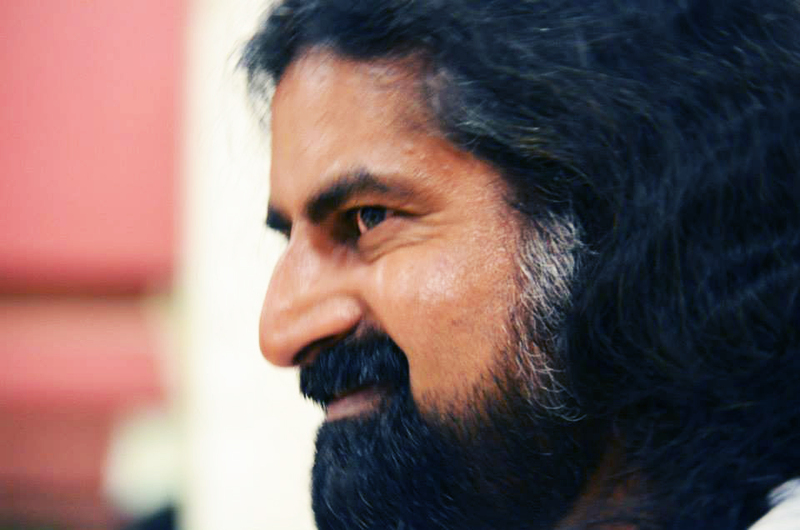 To my utter surprise, it was the body profile of my Master – Mohanji. A common man may think of this as hallucination and may write it off, my every step moving forward towards that gentleman whom I do not know, was giving me a feeling of no fear but a divine light. None other than my Para Brahma Mohanji, HE turned around and loudly called the driver of Innova, his car parked on the left side. It was indeed the most familiar voice of Mohanji! I was still, standing still like a statue, I pinched myself, seeing HIM. But as our tradition speaks, Act Fast Act Now – do not delay and do not procrastinate – NO Tamas, so, I moved myself. He asked me casually to help to lift that wounded dog, hit badly by some vehicle. I was in that strange but blissful state, not a body, just acting only upon the instruction, held a hand to lift the dog with driver and put in the car. The dog was not responding, when Mohanji checked him, the dog had left his body, HE decided to put him into a pit which was already dug near a tree, very close to the pavement. After burying that divine soul, I insisted, that I will go along with Mohanji to Gurgaon, HE smiled and said, “No Bharti Kapoor, go back home as “I also have to go back, it’s a long distance to cover”. 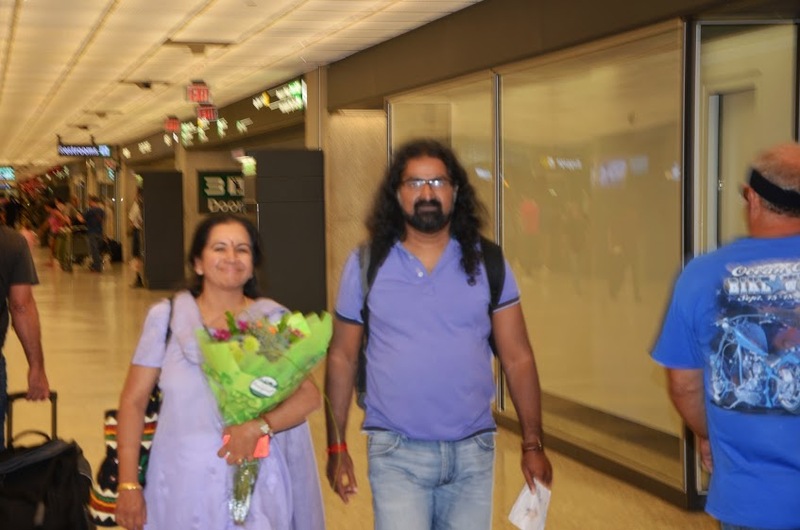 (By then I almost believed that he has returned back from USA to New Delhi and he would be staying in Nandita’s place in Gurgaon). He hugged me and left. I was speechless, could not relate to myself, dearth of words to express even though I had listened and read all Shri Krishna’s stories of Him being omnipresent. Driving back from Chanakyapuri, New Delhi to my residence was the longest drive of my life. So overwhelming! Mohanji comes in physical form to give salvation to a dog hot by a vehicle. The space for burial is ready and dug. He Himself assists and then he says I have to go back a long distance! He was going back to USA! And I witnessed this whole divine leela. WOW! Mohanji used to say “People will recognize me more after I leave my body. Today, since I have a physical form and attached personality, they will not understand. My operating levels will be more tangible for them after my death”. We do listen, read and speak that everything is pre-written but watching all these happenings, Para Brahma Mohanji in the USA and his body in India, coming to heal and transit the dog’s body and relieving him to the Higher realms. What should I believe? Am I hallucinating? Of course NOT! What a Guru! What a grace! I sincerely pity those who cannot understand him or get fooled by his unassuming nature. Many a times he even “plays the fool” or behaves too ordinary and ignorant. I understand that it is to ward off the skeptical and undeserving people. I have read that masters can appear in many places at the same time! I experienced it in real life! I DID! The most divine experience of as seeing him in the all incarnations as True Para Brahma (Overwhelming brightness without form) at Ramana Kendra , knowing the bliss that the only truth of life is Him… And the rest is all illusion. I couldn’t share or I was totally reluctant and speak to any one regarding this, as no one will believe me and I, with my utmost faith in him does not have to prove anyone anything about HIM – He being the only truth. 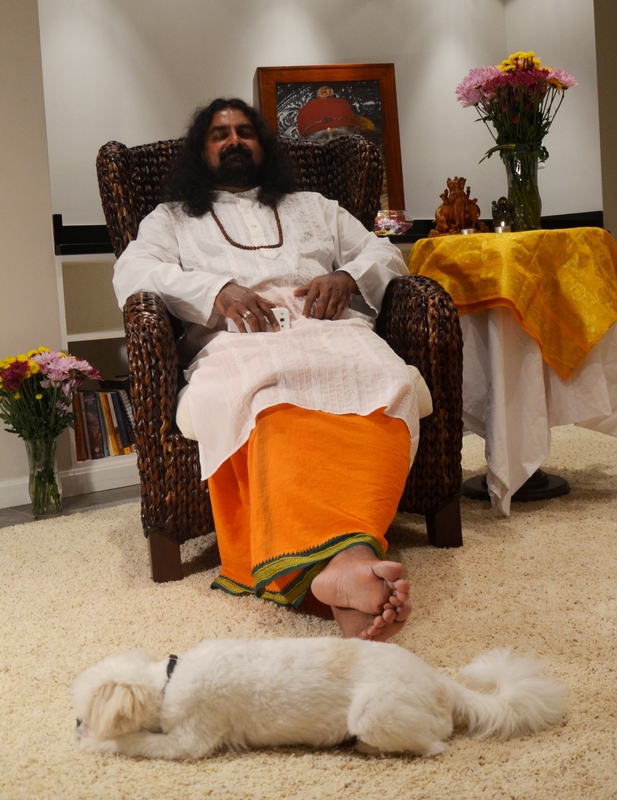 Blessed is that dog in this life time, who achieved NIRVANA… And who was that “dog” who brought Mohanji from USA? We never know. One thing I know – Mohanji never leaves the hand of a true devotee. He must have been a great devotee in a dog’s body. I have seen pictures of animals instantaneously connecting to Mohanji. Form has no value. Only faith and devotion has value. Blessed are those who are in touch with HIM as a living master. Blessed are those who have the faith to go with HIS flow without judging and questioning and with complete surrender. Beloved Father, the ones who don’t have to or want to, will never believe and one who wants to test you, will never believe but I have seen all this with my naked eye; I am still in that blissful trance. I texted you on whats app to check where you are and you replied that you are in USA! What a Leela Bhagawan! Para Brahma you have always shown the world your ordinary and totally unassuming self, which normally confuses a person who does not know your true self. Perhaps that is what you want; those who cannot see need not see. Am I right? But whom you feel is eligible shall seek you, a true master like you does not have to prove anything to anyone. Your existence physically proved itself once again, that my faith in you that I saw you, felt you, touched you, pinched myself to see if all was real, I have dearth of words to express all, still wrote in simple words to devote these pearls to you my father. A small group of young adults who came to “get blessings” from Mohanji were quickly drawn to him. 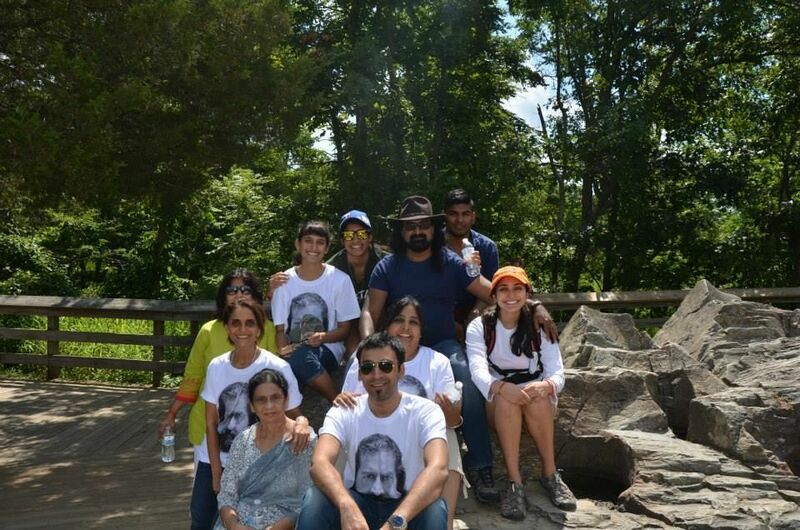 They thought he was the coolest “guruji” and wanted to take him on a trek. How cool is that? 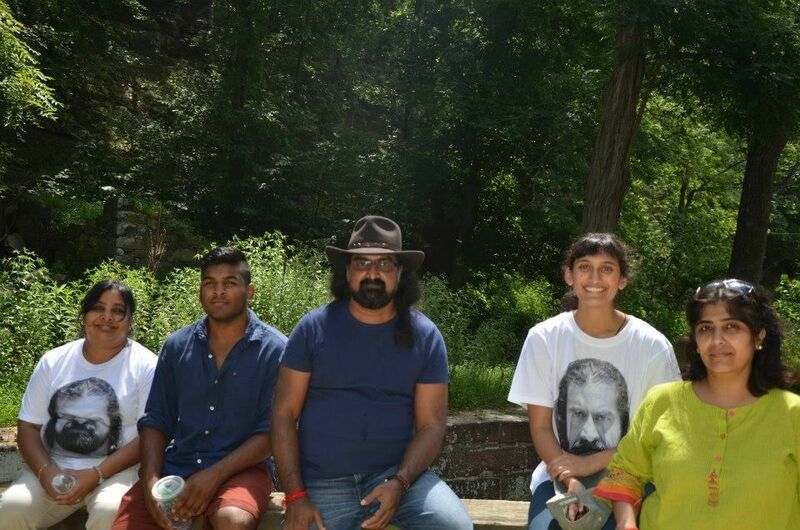 Mohanji joined a small group of young adults, ranging in age from 15-20yrs, at Great Falls Park in Maryland. 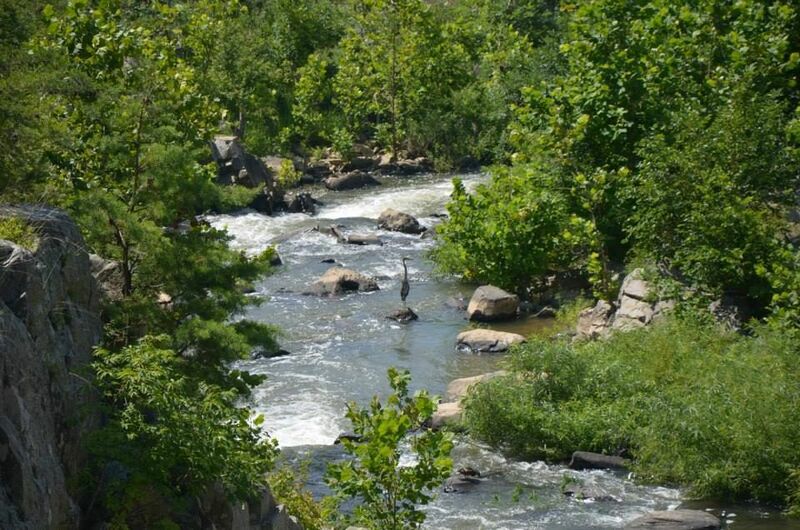 He enjoyed being in Nature, walking through the trails, watching the rapids and observing the flora and fauna. The kids were eager to show him around and were full of giggles and chatter and questions about spirituality. 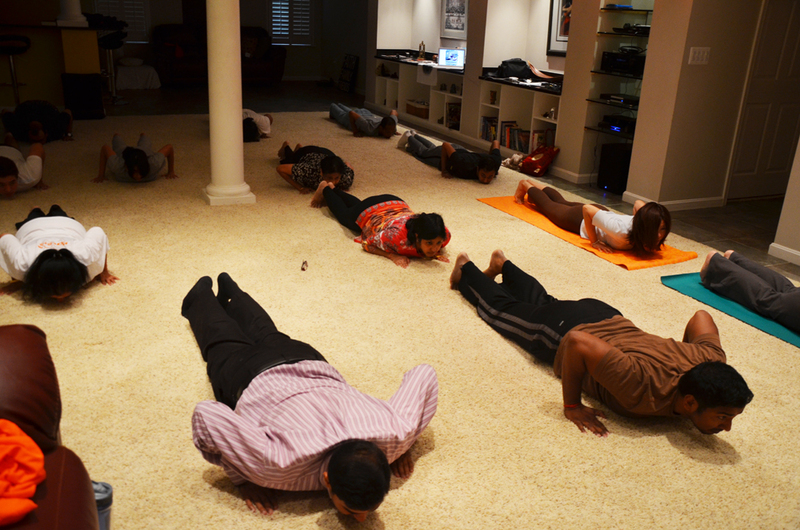 After Mohanji had worked out our minds and intellect through satsangs he decided our bodies needed a workout. Yoga sessions started at 6:30AM. The presence of the Guru definitely drove the tamas right out of our bodies. 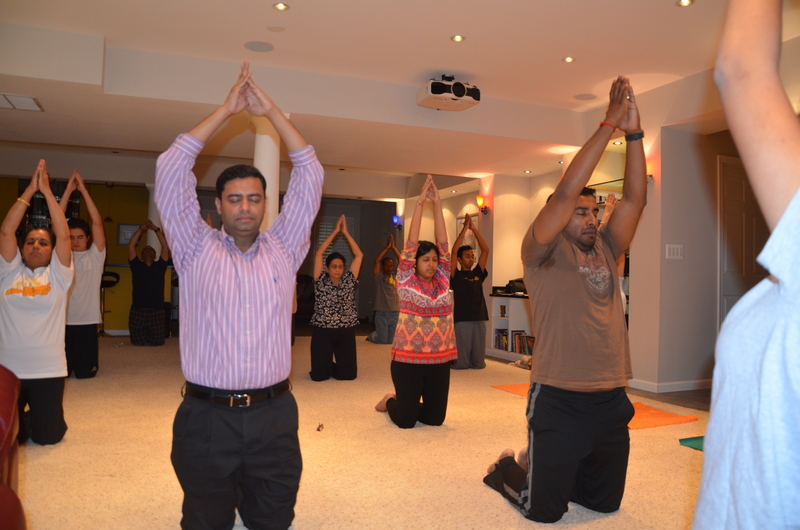 Everyone was present on time and enjoyed the simple yet challenging yoga postures. We all watched in awe as Priya, our young & gorgeous yoga guide twisted like a pretzel, flipping back and rocking forward effortlessly. May be one day…..a long time in the distant future….we will get there, but for now we were happy to just have fun in a group and attempted the moves. 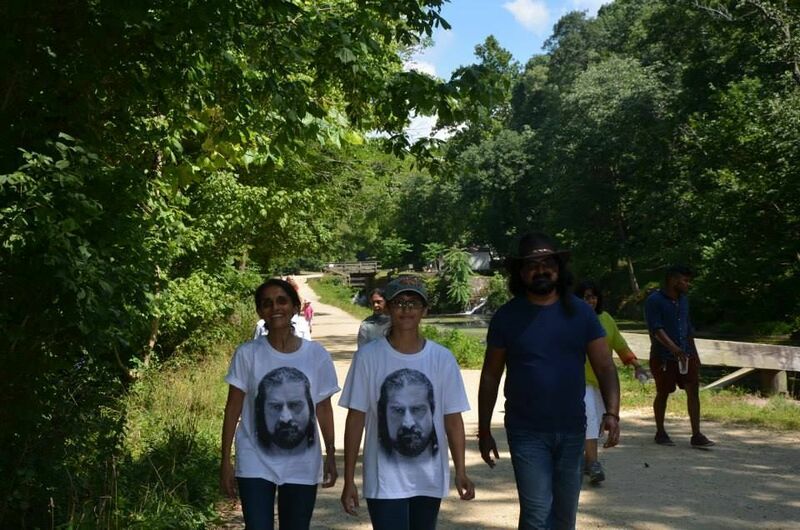 After the yoga session Mohanji & the whole group went out for a walk. 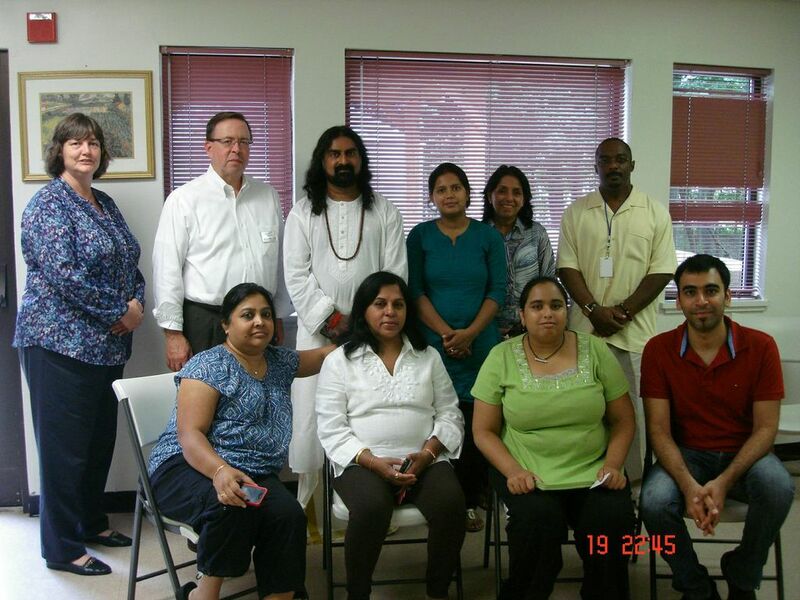 Mohanji was invited to speak to the patrons of the Herndon Senior center, to help them cope with Life Transitions. We were expecting anywhere between 3-10 participants and we were pleasantly surprised to see over 25 participants. 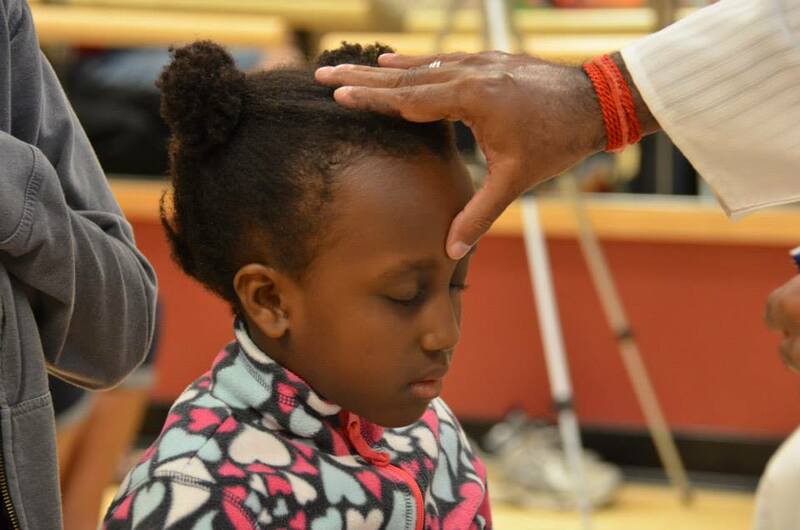 Mohanji guided them through a breathing exercise called yogic breathing. Once they were rejuvenated, Mohanji spoke to them about life transitions. The elders were very open and receptive. One of the ladies could actually see Mohanji’s aura. By the end of the talk they all wanted him to come back every week and speak to them. They were shocked that he does not live in the US and very innocently asked if we could transport him or keep him back here. When eye cards were distributed and one lady very innocently wanted to know what to do if she fell in love with him by looking into his eyes Ha! Ha ! The whole space was reverberating with love and joy. Mohanji brought great joy to this group of seniors, making them forget their ailments and aches and pains at least for the short period of time he was there. I could see hope in their eyes. Mohanji was like a rock star among the seniors, who were clamoring to speak to him and get shaktipat. We had to whisk him away, like a celebrity so the seniors can go ahead and eat their lunch. 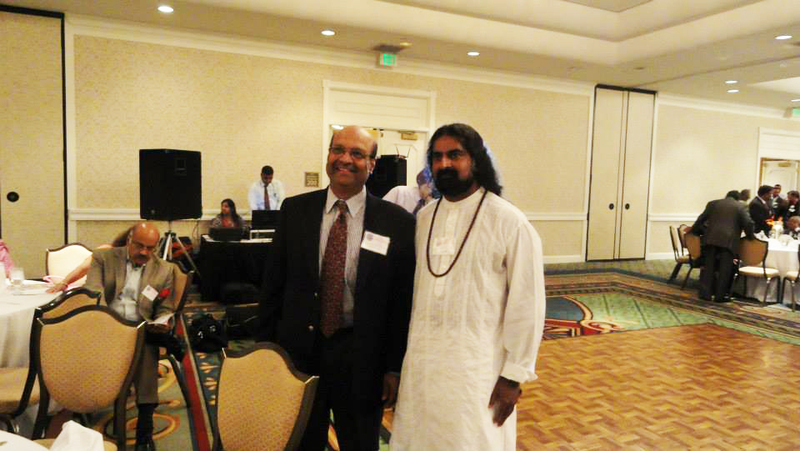 Mohanji was invited by GOPIO (Global Organization of People of Indian Origin) to be a Special Guest at the Gadar Centennial Commemoration on July 28, 2013 at Rockville, Maryland. The Gadar Movement was started by Indians living in the United States to liberate India from British Colonialism 100 years ago! The event was organized to pay tribute to Gadarites who made sacrifices – thousands were imprisoned for life or executed. 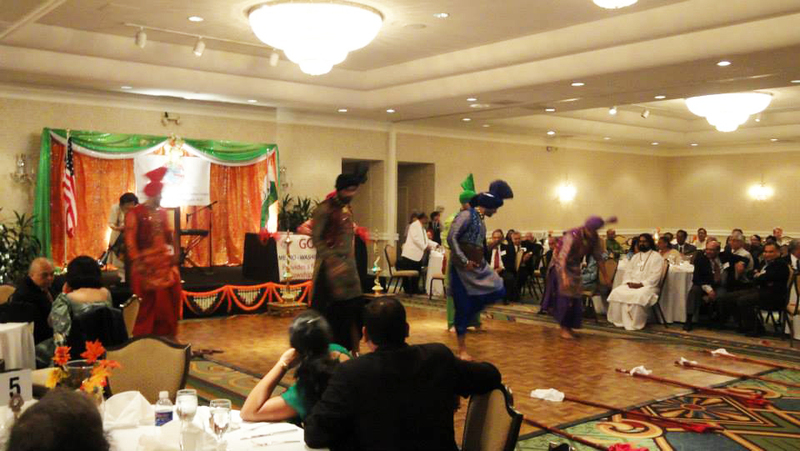 The event was organized to pay tribute to Gadarites who made sacrifices, in the United States to liberate India from British Colonialism 100 years ago! The event was attended by several dignitaries including the Indian Ambassador to the US Ms. Nirupama Rao, the Surinam Ambassador to the US Subhas Ch. 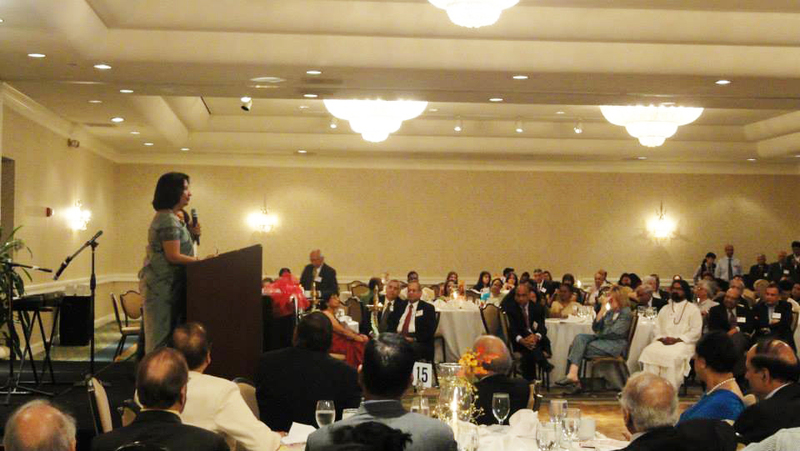 Mungra, Montgomery County Executive Isiah Leggett and several leaders – in education, medicine, government and business from the Indian Community. 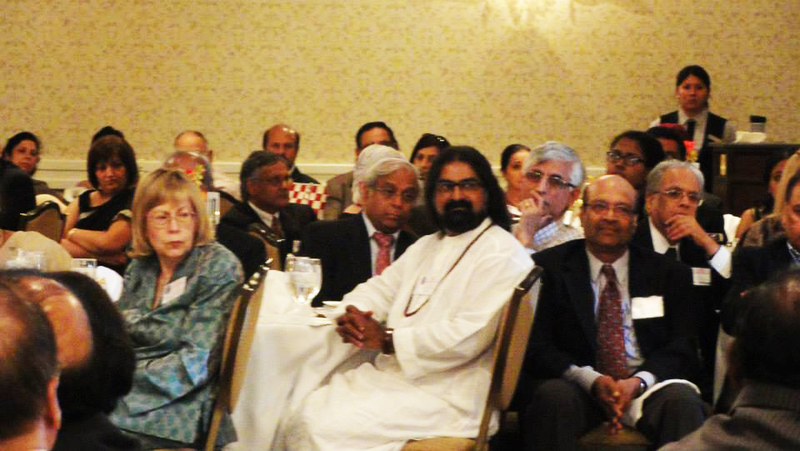 The event was attended by several dignitaries including the Indian Ambassador to the US Ms. Nirupama Rao, the Surinam Ambassador to the US Subhas Ch. Mungra, Montgomery County Executive Isiah Leggett. Mohanji was warmly welcomed by Dr. Satish Mishra and Dr. Daniel Chelliah and introduced to several dignitaries including the Indian Ambassador to the US. Many were interested in the spiritual and service projects and have sought to meet Mohanji to discuss further on how we could work together to bring message of peace and unconditional love to the people especially the youth in the United States. They were working out how to spread the message of peace and unconditional love to the people especially the youth in the United States. 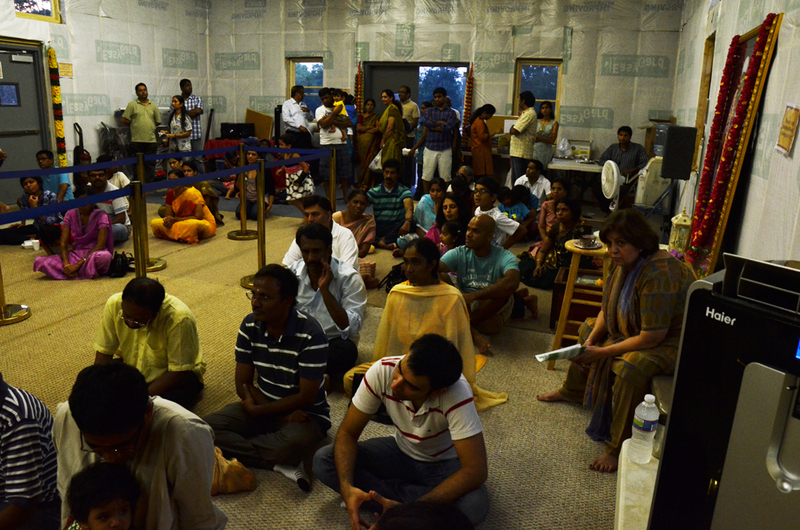 The day was here when the first big meditation was happening in VA, at Stacywood community center. 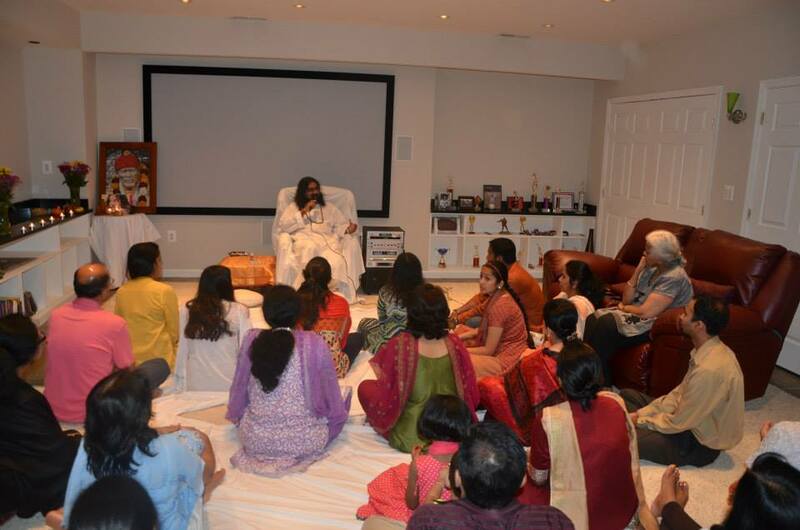 As we were about to finish the preparation for the meditation, people started to come and were being seated. Fifteen minutes before the start we had about sixty people all from different cultures and backgrounds. “I am always with you.” Mohanji always says, i.e. His consciousness permeates everything and is everywhere. Just keep connected. Go within. It was so beautiful to see how a Master brings the variety of vast world into a small room 🙂 By the end of the meditation when people opened their eyes Mohanji was among them sitting in front. Love is always there, just express it. Mohanji did a Satsang, a lot of devotees got their questions answered and a lot got their messages through others’ answers. 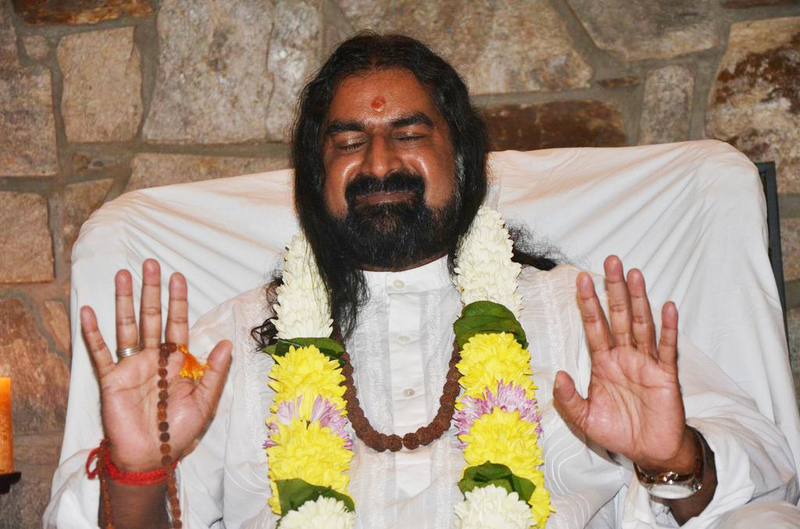 After the Satsang, Mohanji delivered Shaktipat to all the devotees who came. It was a beautiful sight to see people so connected even those who came for the first time. The event was concluded by a devotee who sang a beautiful bhajan or a prayer song as gratitude with Maha Prasadam, indeed a memorable evening for all of us. 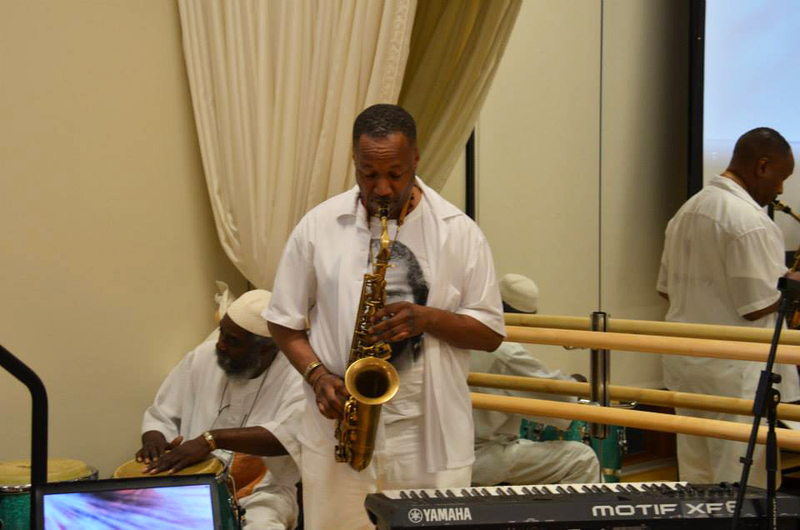 The event beautifully and gracefully ended with music – a prayer song and saxophone. The lyrics from the hymn All Things Bright and Beautiful, comes to mind when I think of Mohanji’s approach to God’s creation. This is the first time I have been in close proximity to Mohanji, observing his interaction with people of different races, religion, color, and not to mention personalities. Mohanji treats everyone equally with utmost respect, patience, tolerance and unconditional love, the way an ordinary person, controlled by emotions, will not be able to do. His love and respect for all beings can be witnessed through his interaction with our four-legged friends as well. Mohanji takes the phrase “all creatures great and small” to a whole new level by the way he treats humans and animals with the same level of love, respect and dignity. My little dog Roscoe is a personification of the term “Lucky Dog”. He has had the unique blessing of receiving Shaktipat from Mohanji. He has been blessed by Mohanji so many times that he is buzzing with energy now. Roscoe designated himself as Mohanji’s mascot. He would follow him around the house and when Mohanji sits down he would snuggle up beside him and very confidently rest his chin on his lap. It was so beautiful to watch Mohanji relaxing on the sofa, watching TV with Roscoe cuddled up beside him. They looked like a couple of guys just hangin’ out. The first time Mohanji met Roscoe, he said Roscoe recognizes him. It was so true, the way Roscoe’s behavior changed when he was around Mohanji. There were moments that Mohanji and Roscoe would just look at each other intently. I am sure they were talking to each other about how crazy humans are ha! Ha! Whenever Mohanji left the house for a session, Roscoe would cry and whine and make a big scene because he wanted to go with him. I assumed that he was doing that because he was being pampered. But once Mohanji left, the whining had stopped and he couldn’t care less when we went out. He just wanted to be around Mohanji . He moped for almost a week, going to his room looking for HIM, and coming back up in disappointment. Not only house pets, but all kinds of animals were attracted to Mohanji. 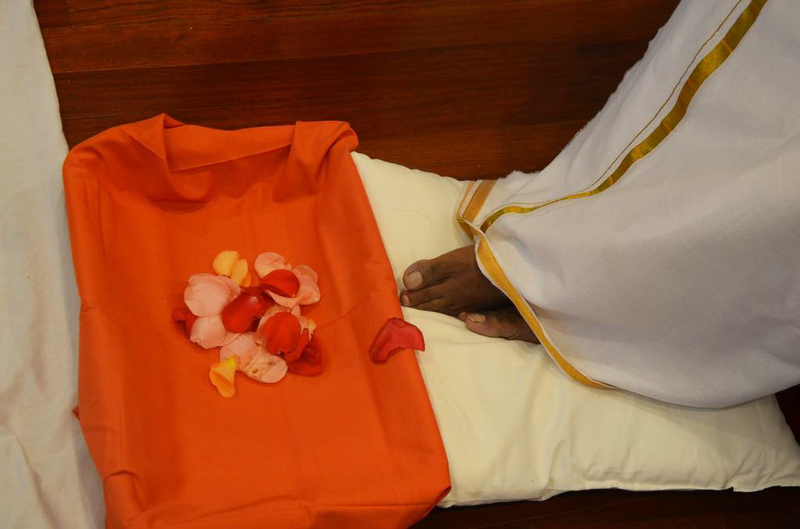 After performing the Havan, Mohanji was resting a bit while he was still in the expanded state. A little black cat, climbed on him, walked all over his body, checked him out, found a cozy spot on his lap and snuggled up, while Mohanji just relaxed and let the cat enjoy him like a loving father would let his child play with his body. Animals are so pure, they totally surrender to the Master, with no inhibitions. That’s a lesson to be learned from our cohabitants. Everywhere Mohanji went, birds flocked around him. In the middle of Washington DC, out of nowhere a group of sparrows showed up to pay their respects to the Master. Sparrows are always on high alert when they are around human beings, moving their heads from left to right every second, as if watching out for danger. I noticed that as the birds were receiving blessings from Mohanji, they were comfortable getting close to him and the frequency of their head movement had decreased significantly, as if they felt really safe and secure!!! The birds intuitively knew that this was no ordinary being!! Mohanji ‘s heart is filled with love, respect and compassion for all of God’s creation. A young couple had brought their dog with them to the Havan. Mohanji gave that couple the option of offering a coconut to the fire on behalf of the dog, burning his karma from past lifetimes, removing all negativities and clearing all ailments. This gesture really touched the hearts of all who were present. Thank you Mohanji for showing us another facet of unconditional love!!! It is a bright sunny day, with a gentle breeze and birds chirping in joy. Celebrating in anticipation of the arrival of the Master. It was a busy morning preparing for HIS arrival. Thanks to technology, Lady Google gave us tips on “how to welcome a guru”J. The preparations started a week before his arrival, making a list checking it twice, planning the menu, getting his room ready… we were like giddy teenagers, planning the coolest party in town. The day had finally arrived. Mohanji was welcomed by his youngest devotee in the US, a little girl named Tanishka who has a very strong connection with Mohanji and was very happy to see him and give him the picture she drew for him. This was the first time she had seen Mohanji in physical form and there was an instant connection. 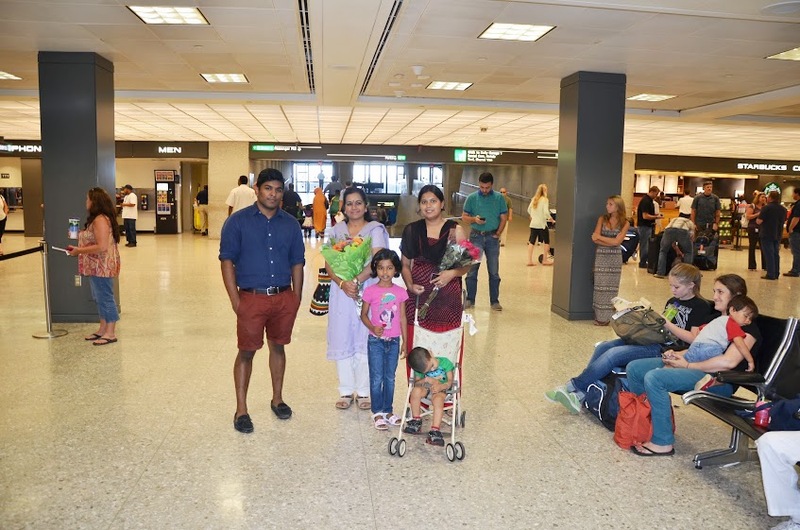 When Mohanji arrived home, he was welcomed with honors (Poorna Kumbha and aarti). Once home. Mohanji put everybody at ease with his relaxed style. All the excitement that was building up over the weeks quickly dissipated and I felt like my big brother was home for vacation. No excitement, no butterflies in my stomach, no anxiety or nervousness. Just a feeling of security. 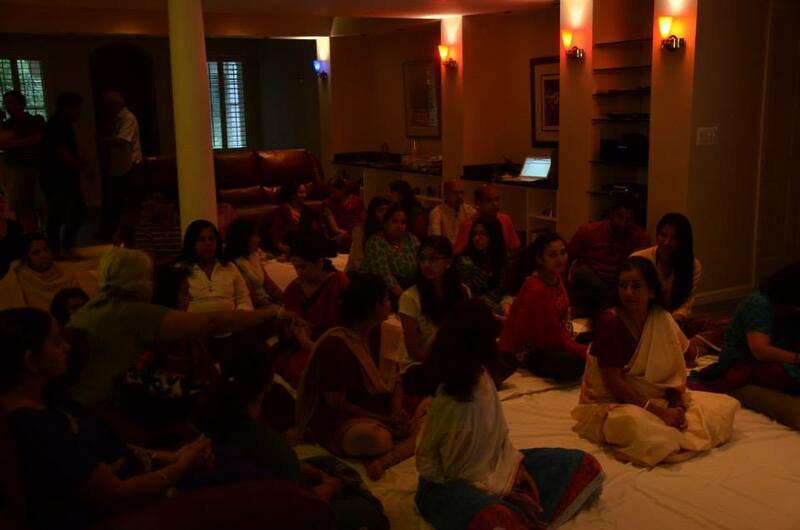 What started out to be an event for a very small group of devotees turned out to be meditation and Shaktipat for over 50 attendees. 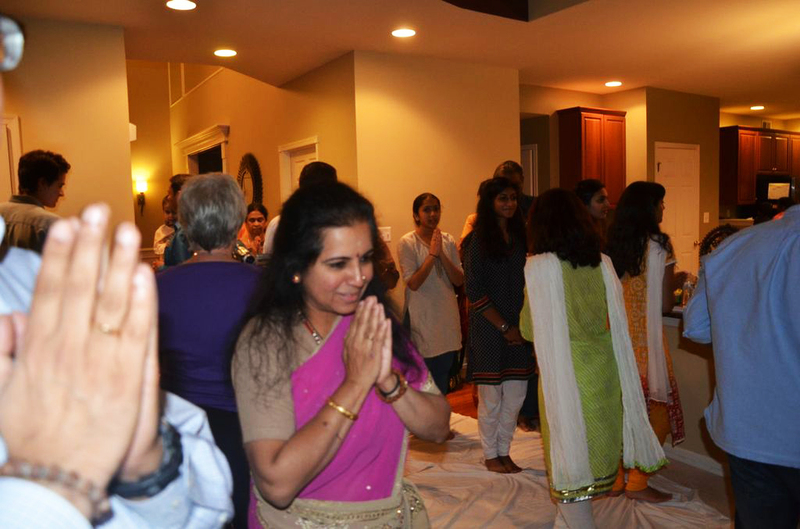 Mohanji’s devotees were very excited to be led through the meditation with their beloved Master. The whole group was in a total state of bliss. This was indeed a blessed day, since he has planted the seed of transformation in the Western Hemisphere. 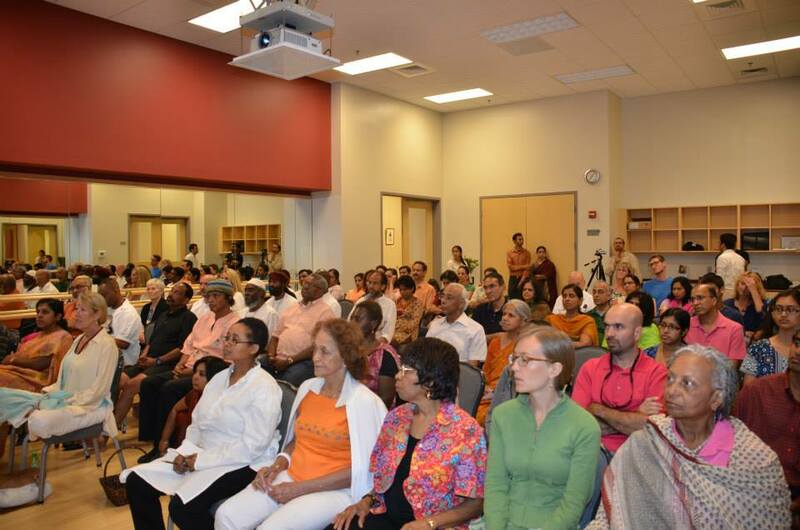 Mohanji conducted his first satsang in the US at the Shirdi Baba Mandir in Dulles, Virginia. Coincidentally he happened to be the first guest at the temple which was just inaugurated a month before. 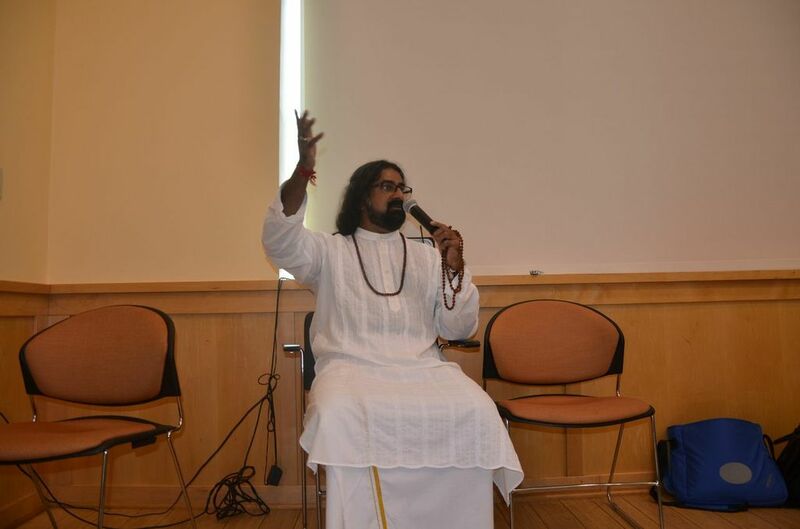 During his speech Mohanji said that this is the STARTING OF THE TRADITION in the USA. Mohanji had an evening of rest and he was ready to work. His day started off with a TV interview with Ganesh. Random people at the TV station were drawn to him and wanted to talk to him. One of them Mr. Surinder Singh was really impressed with Mohanji . The taping was done in one take with no interruptions or retakes. Without much preparation, the interview flowed with easy, one question leading to another. Mohanji felt like he was home. He was in love with this temple and the organizers made sure he was welcomed with full honors and felt at home. Being a Thursday, there was a steady stream of devotees who came to the temple for darshan and stayed on for the satsang. 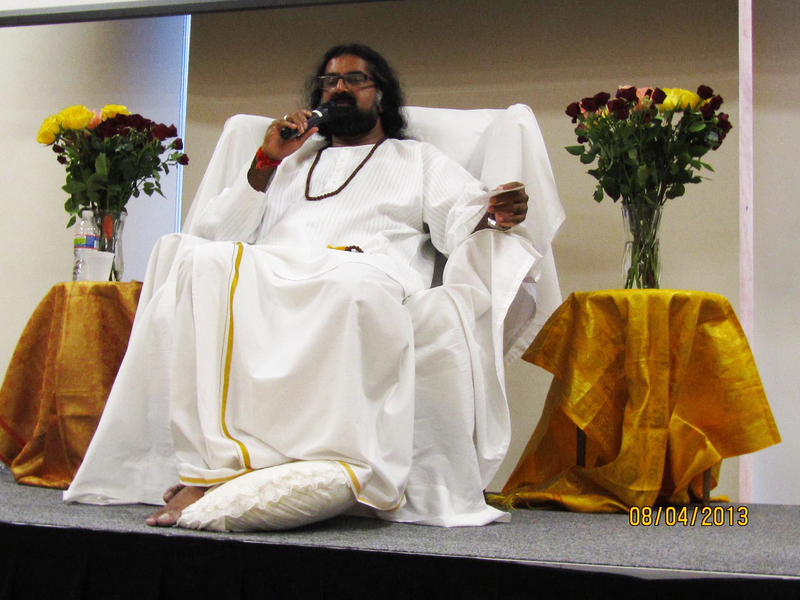 Although people were a little hesitant to ask questions, once they heard Mohanji’s answers to their questions, people let their guard down and soon the questions were flowing. Before long, it was time for Aarti and Mohanji had to end the session. I could actually hear the sigh of disappointment from the crowd. They did not want the program to end. As has been the case with all of Mohanji’s session one never gets enough of him. 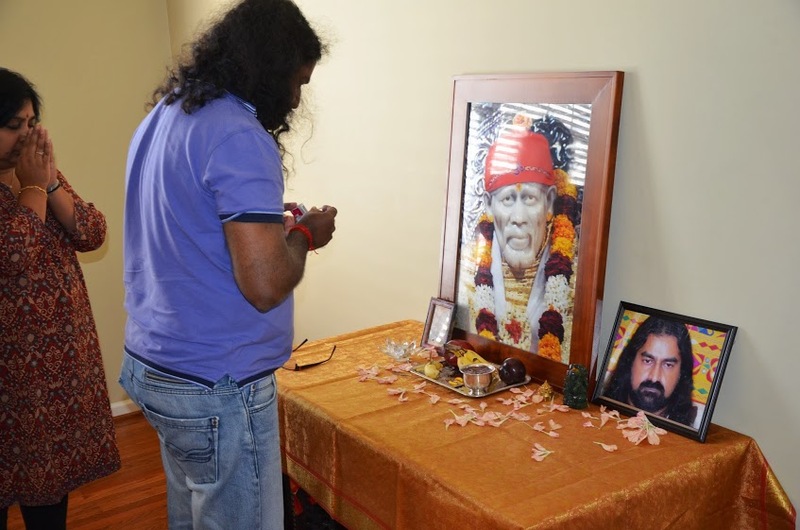 Mohanji conducted the Aarti for Baba with such devotion and love. I had the privilege of taking pictures of him doing the Aarti, and looking through the lens waiting for the right moment to take a picture, I could actually experience his love and devotion for Baba in his facial expressions. Lucky Me!!! 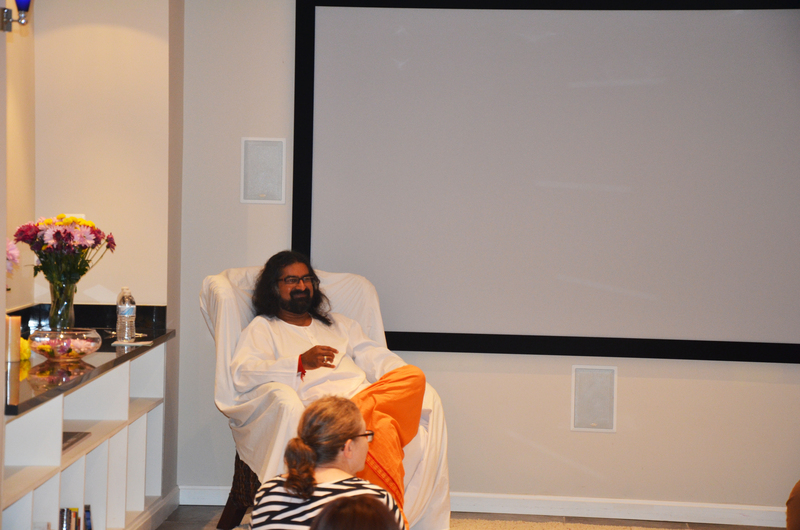 It was an auspicious beginning to a very successful and gratifying tour in the US. I felt so overwhelmed with mixed feelings that day. Like a kindergartener going to school the first day holding her Papa’s hand, feeling safe that he is there, yet a little scared and confused, proud of her dad, clueless as to what’s going to happen next, and Boy! Does a child’s life change after that first day in kindergarten… So did mine!!! Thank you Baba!! 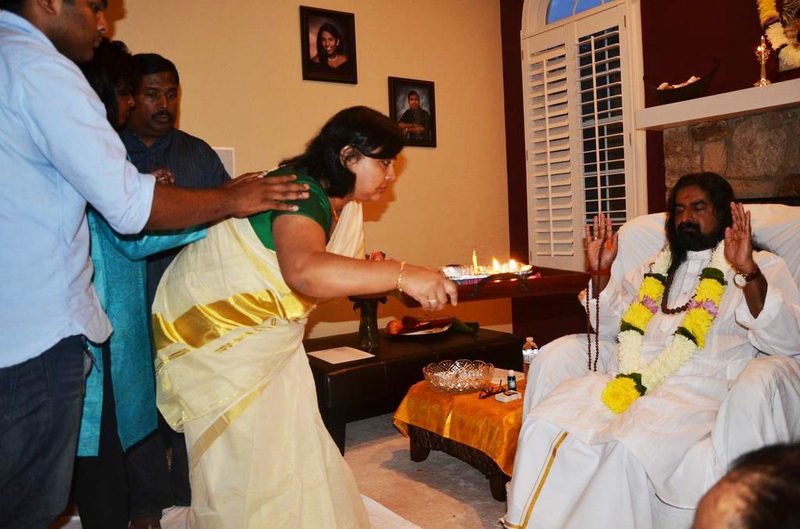 Guru Poornima celebrations started early in the US. 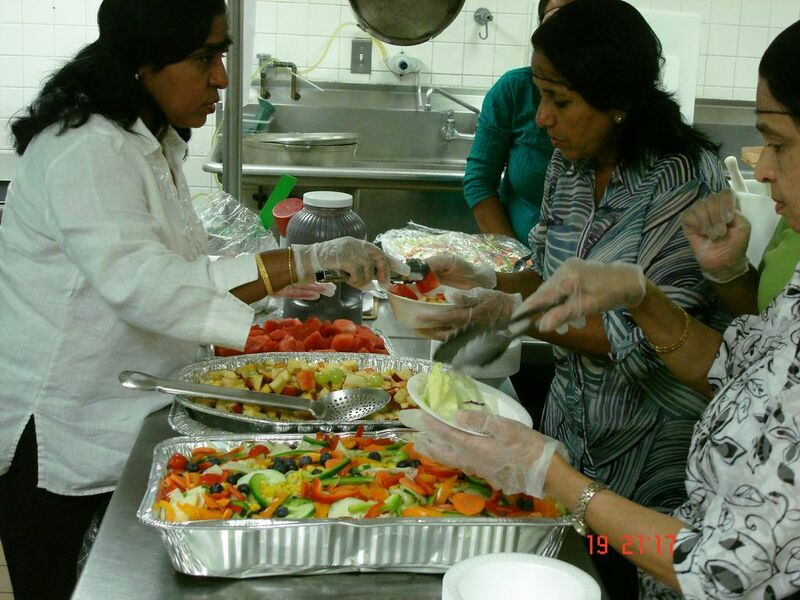 On the 19th of July, we kicked off the events with a Food Seva Activity. 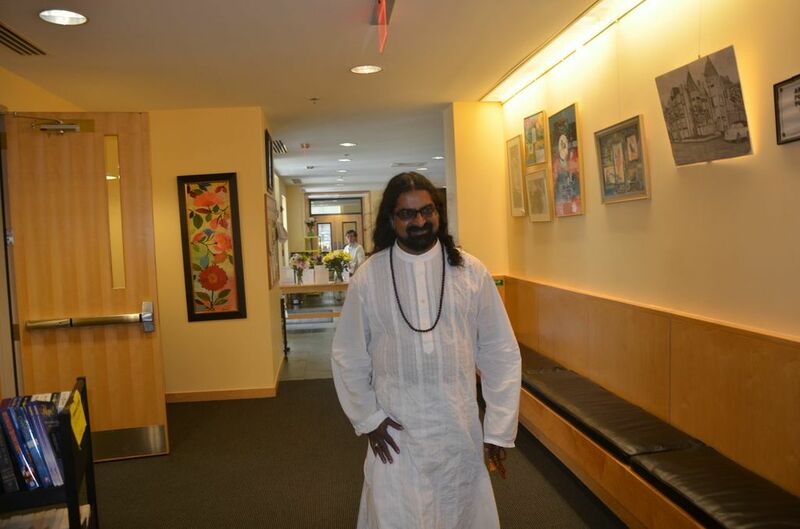 We visited Embry Rucker Community Shelter in Reston Virginia USA , a shelter for homeless people and families, for food seva with Mohanji and all the devotees who contributed towards this noble cause. As we entered the shelter the management greeted Mohanji and all of us with a very warm welcome. 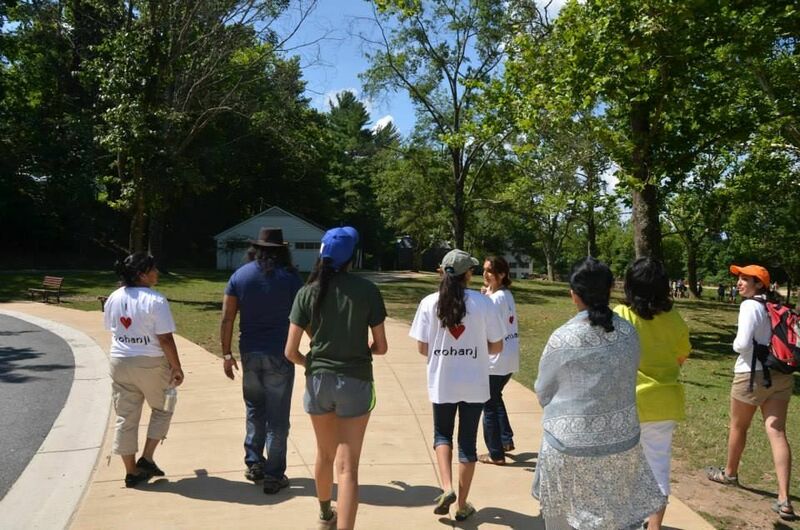 The seva bhaav in all the volunteers of the shelter and us was amazing. 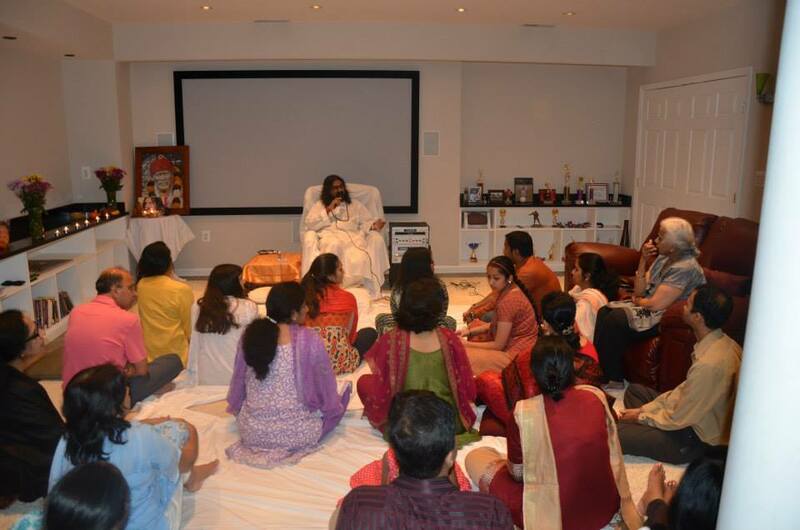 All of us got together in their huge kitchen and started preparing for the food seva. After the food seva Mohanji and we all met the Senior management of the shelter to talk about the future plans, how ACT can help the shelter in their activities and projects, about the future goals and vision and how we can achieve that together. This facility provides transitional housing for approximately 15 families and also serves the larger community providing hot meals. ACT Foundation USA had been working with this group in the past and it would only be appropriate to take the Masters to this shelter. Although I have had some amazingly miraculous experiences with Mohanji, my mind always tried to convince me that I was imagining stuff. I guess Mohanji knew that too and he started to hit me up with one miracle after another till I put my hands up in truce J. I was about to have a taste of Mohanji’s leela. We had cooked food for about 40 people. I had planned the menu to be an easy breezy spaghetti with tomato sauce, salad and dinner rolls and cookies for dessert. This does not need any cooking skills, just an assembly of store bought products. In typical Mohanji style, night before he informed us that we should cook Indian food…..like samosa. That was my first test. He put a wrench in my perfectly planned assembly line of food. Where was I going to get 50 samosas before 11am? I put my thinking cap on and quickly made arrangements for Indian food. We had vegetable rice. Chole. 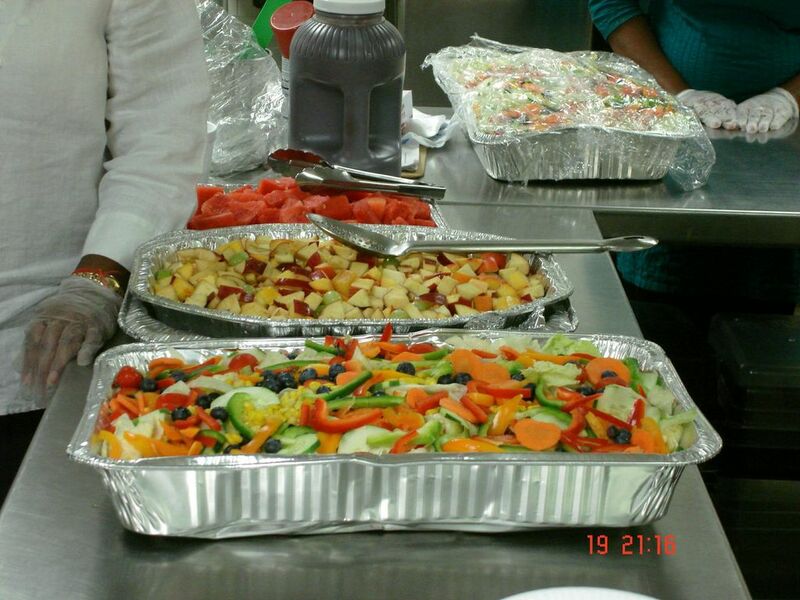 Vegetable cutlets, salad, and fruit salad. All proud of ourselves. 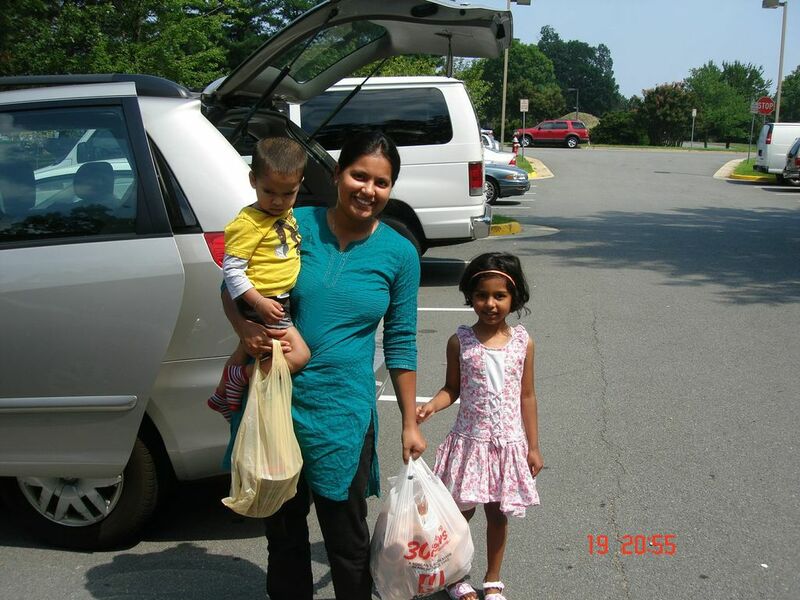 We loaded up the van with the food and happily drove off to the center to deliver the food. 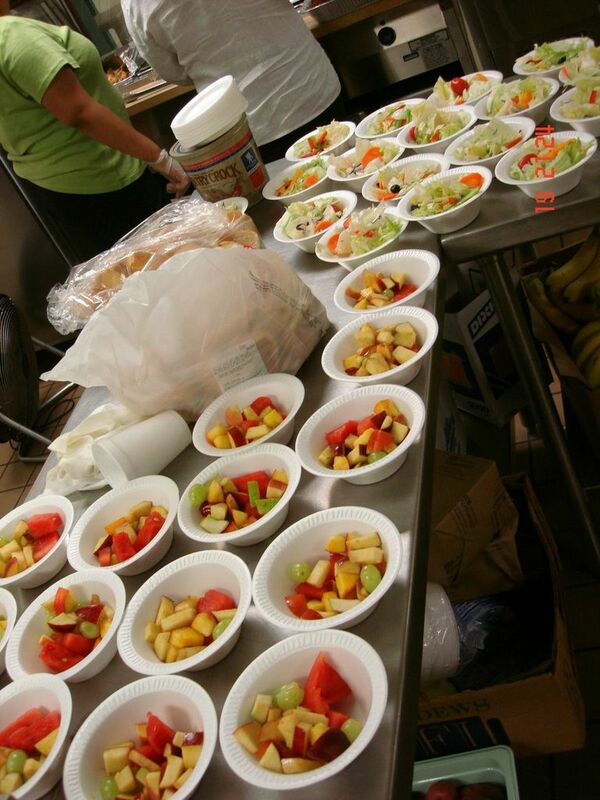 We set all the food out and were ready to serve… Lunch time arrived and there was nobody around. I asked the director and he informed me that a new policy was in effect and that they had sent out messages to their regular patrons that they do not serve lunch in this location anymore and that he expects approximately 15 people. I was devastated… we jumped through hoops to get the Indian food for 40 people and now there was no one to eat it. I swallowed my pride and humbly walked over to Mohanji and updated him on the situation and suggested that we should eat and leave and the rest of the food will be served at night. He told me “don’t eat the food, after everybody eats we will eat what is left over”. “Yeah Right!!! 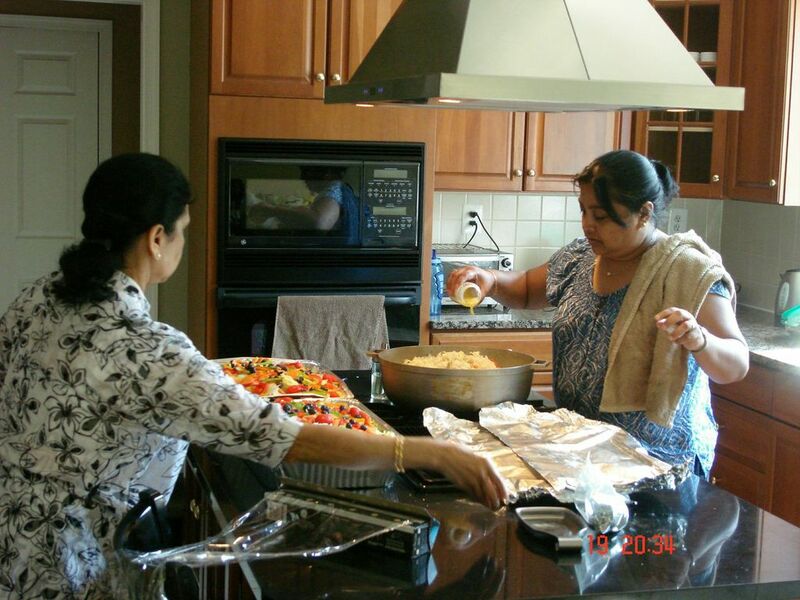 !” I thought to myself as we started to lay out the food and Mohanji sat there in the kitchen watching over us. Thank you Baba for all the blessings in my life and I am blessed indeed!!! 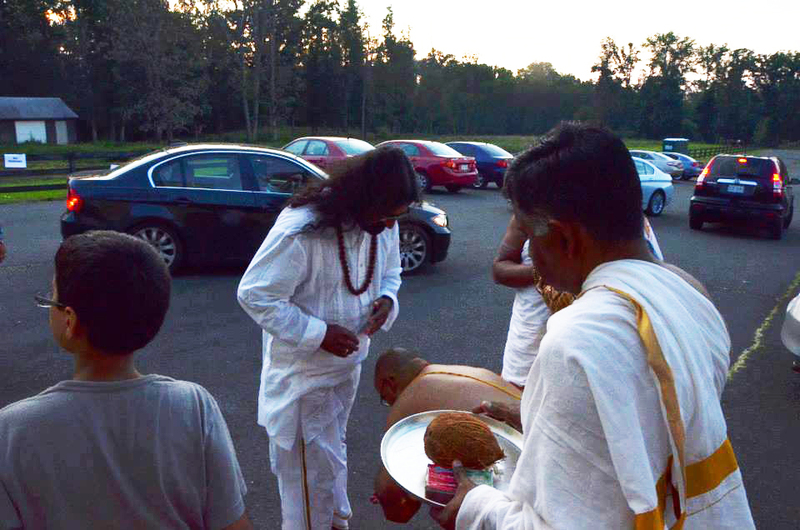 Guru Poornima celebrations went on throughout the weekend, starting with Food Seva on Friday to Pada Puja on Monday. 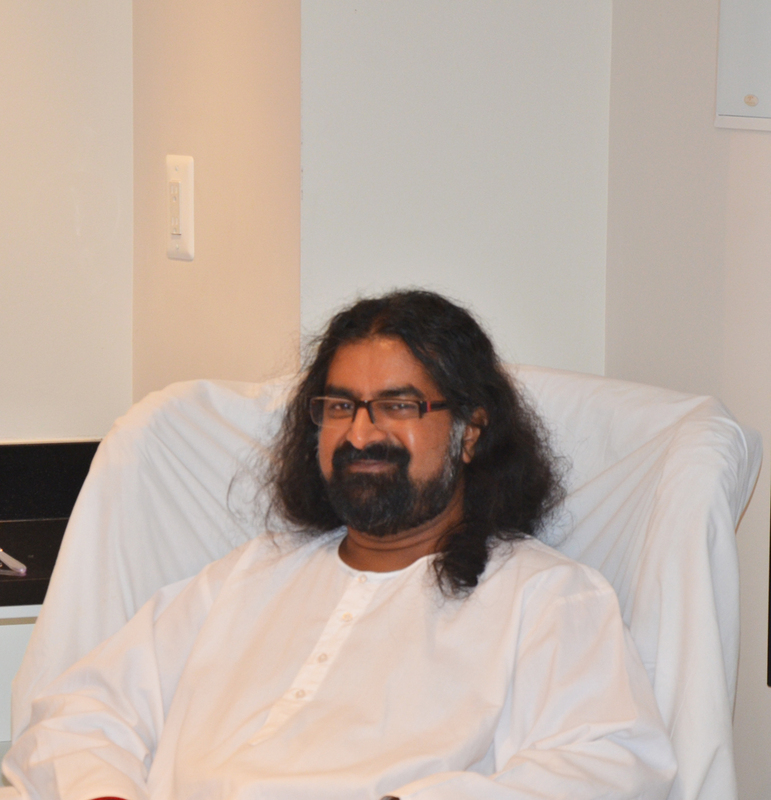 Sunday, the day before Guru Poornima day, was a very busy day for Mohanji. 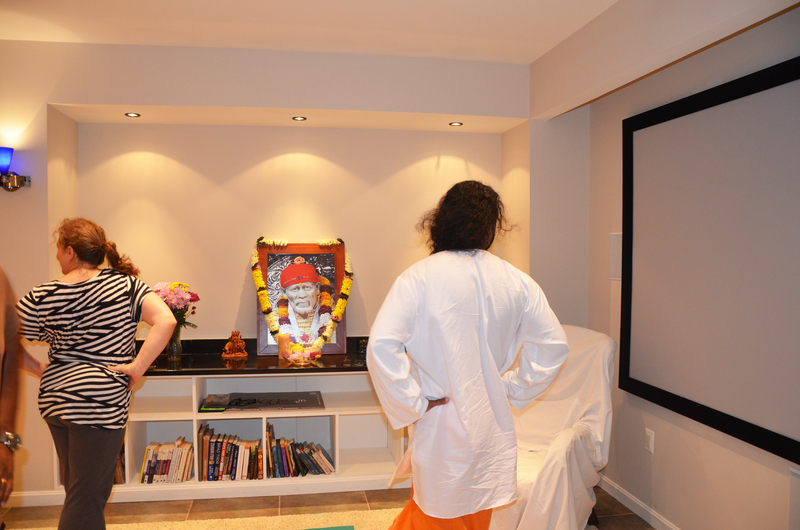 It started off with Guru Pooja and chanting at Lata and Ganesh’s house at 10am. The group chanted xxxxxx stotras. 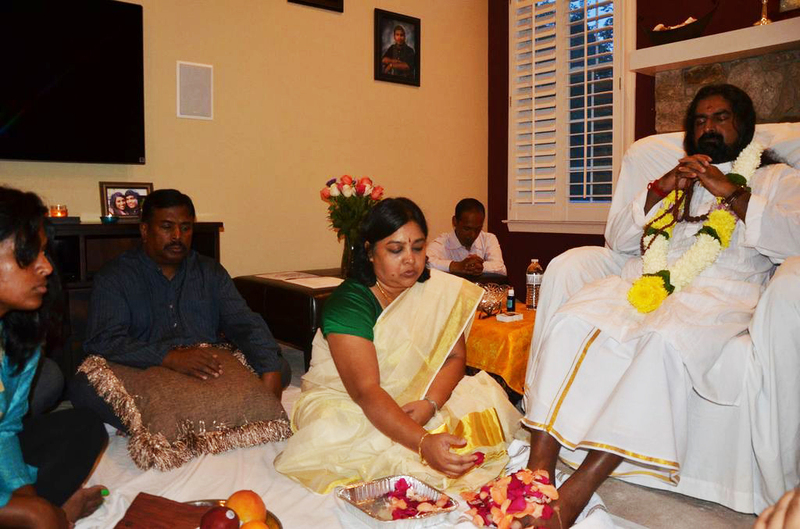 Mohanji led the Datta Gayatri chanting followed by the group. The whole house was reverberating with high energy from the chanting. Mohanji was served an authentic Kerala meal prepared by Lata. 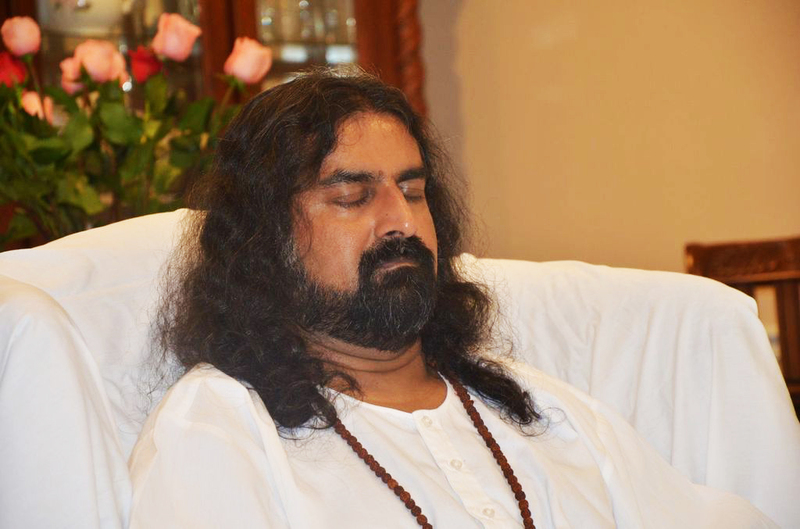 After lunch Mohanji went for a very short afternoon siesta, followed by Satsang at the Rajdhani Mandir. 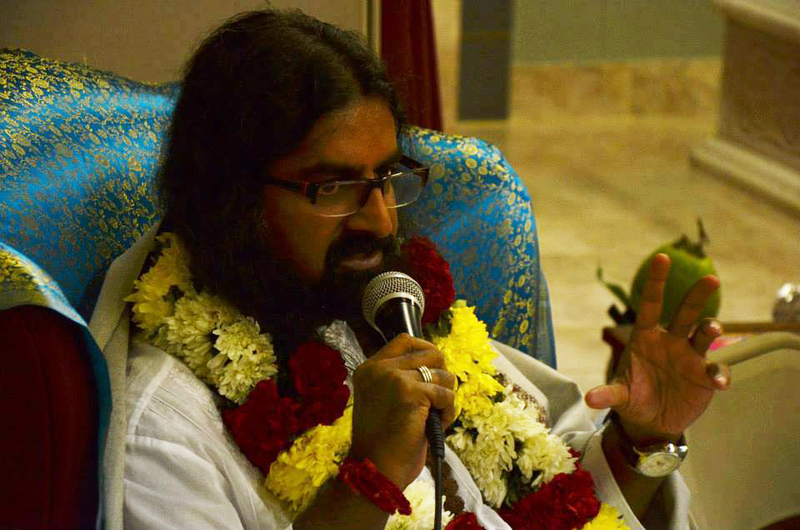 Here, Mohanji spoke about the Importance of Guru in one’s life and the significance of Guru Poornima. 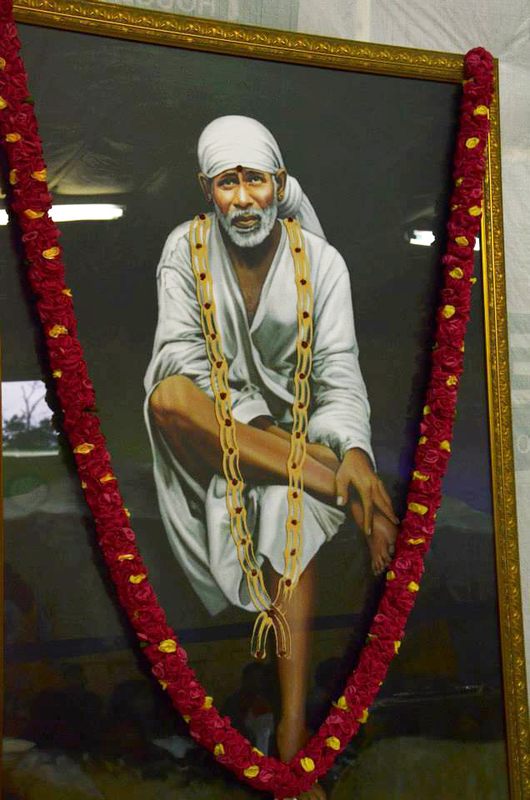 Mohanji was seated in front of the Shirdi Baba statue while he gave his speech. It felt like Baba was watching over HIM as he was speaking and answering questions. 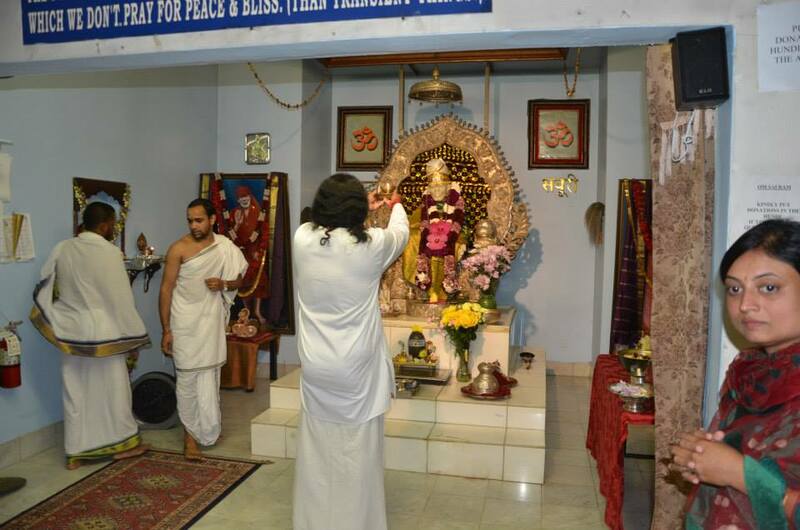 From there he moved on to the Shirdi Sai Mandir again for a brief Satsang and Q & A session. Since they had a taste of Mohanji earlier in the week, seekers came prepared with questions for Mohanji and made good use of his time. Again, when Mohanji closed the session, people felt that they had not had enough of Mohanji. They wanted more, understandably so. This has been the trend wherever Mohanji goes. It was a long day for the Master, but he was not ready to call it quits. 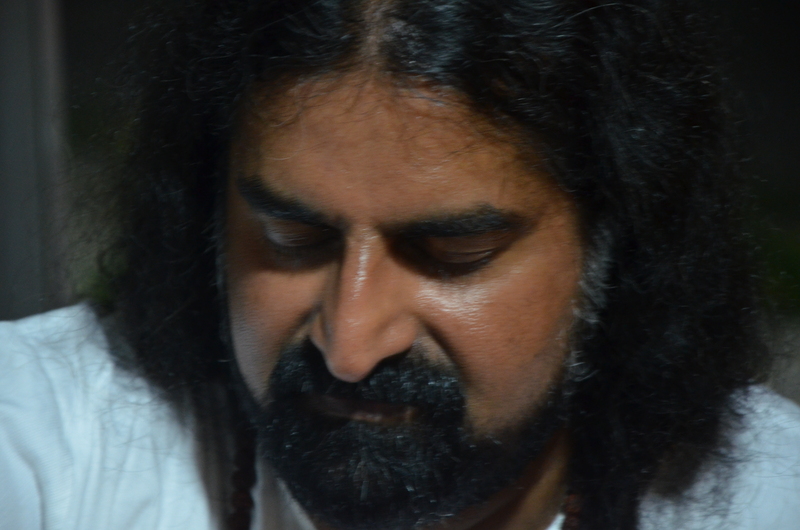 He replied to emails and a little past midnight, got ready to record his Guru Poornima message. I wish I had 1/10th of his energy and life would be golden. Karan was recording and I was the light girl… as Mohanji delivered his message in one single take with no rehearsals. 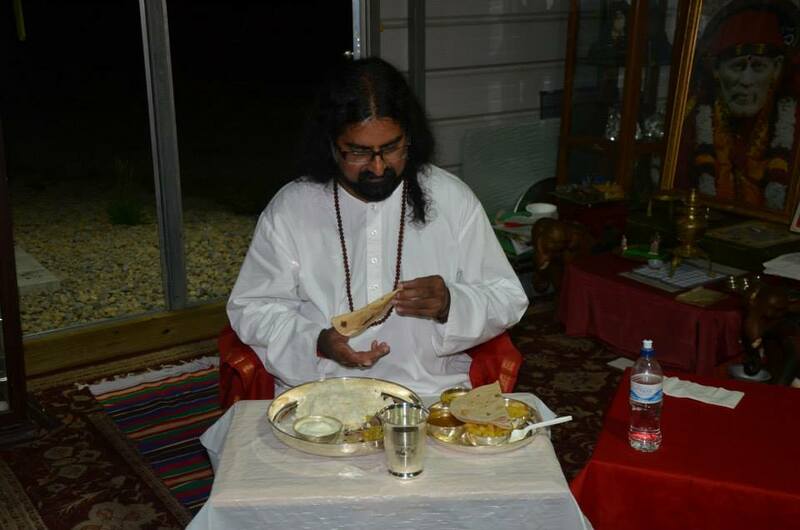 On Monday, Guru Poornima day, a pada puja was arranged for Mohanji at our home. 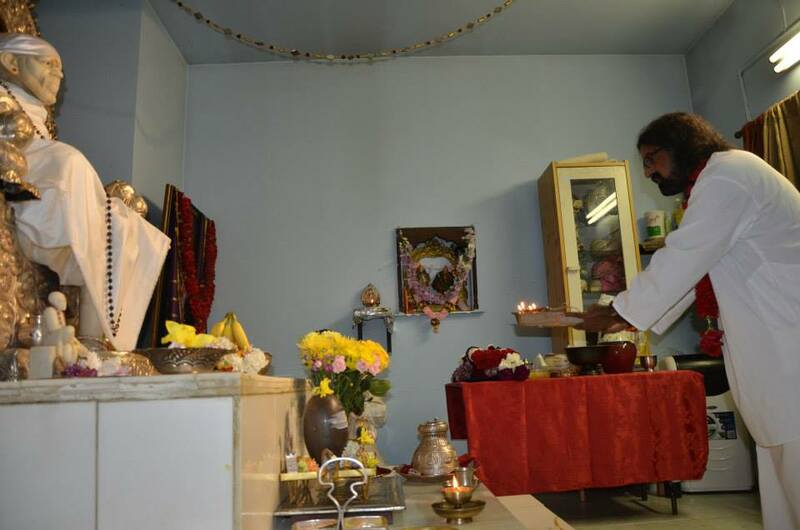 The pada puja was followed by chanting of Mohanji Gayatri and short Satsang. This was the first time I could experience the various changes in Mohanji’s energy and form. Today was a day for Devi Bhav. I could feel the caring love of a Mother in HIM. I was not sure if it was real or if it was my imagination. Seeing the pictures later, confirmed my gut feeling. It was indeed Mother. Many a time I have heard people jokingly say Mohanji was messing with them. I could not relate to it till this happened to me. Mohanji had casually mentioned to us that he enjoys Jalebi. That was all I wanted to hear since I LOOOOOOOOVEEEEEEE Jalebis myself. Taking advantage of this, I ordered Jalebi for Guru Poornima day celebrations, mainly for Mohanji but with the ulterior motive that I can chow down a few myself. With all the activities going on that day, I could not eat any. When I woke up the next morning while I was still laying in bed, I started to crave jalebis. So I quickly brushed my teeth and went down to get a jalebi. To my disappointment I couldn’t find any. I know that there was whole box packed away but couldn’t find it for the life of me. I called all my friends who were helping me clean up. All hands pointed to the refrigerator. I searched high and low, in the fridge, the pantry, the dishwasher, the trash bin …(Yeah I was desperate) bending down, squatting, laying on the floor, twisting like a pretzel…..anything I could do to get my hands on one little jalebi… I was like a junkie looking for drugs. Finally I gave up and casually asked Mohanji what did you do to the jalebi… He gave me a broad smile and said, “ you don’t need jalebi now… I know you have been searching all morning”. I assumed it was a casual, offhand comment and moved on. After lunch, the thought occurred to me again that it would be nice to have a one itsy bitsy piece of jalebi to satisfy my craving. I resigned to the fact that we don’t have any. As I opened the pantry, to put away something, a box of jalebi was sitting SMACK in front of me. I had my head in that pantry about 10 times the same morning looking for other stuff and I swear that box of jalebi was never there. I KNOW that for a fact. My heart skipped a beat… With the door half closed I leaned over and looked at him, without showing him the box of jalebi … and again he gave me the same broad smile and said “you can have one now”. To some, the jalebi incident may seem trivial but to me it took care of any bit of skepticism I had and sealed my faith in him. Any little doubts that I may have had were out the window. HE knows how to get to a person, with me it was with Jalebi. After a long spell of really hot summer days, today we finally had a day of really nice weather. The sun was out, the air was crisp, with a gentle breeze….a perfect day for a long scenic drive. We loaded up the car and left for Pittsburgh around noon. During the first half of the trip Mohanji was immersed in silence, perhaps contemplating his grandmother’s life and death. After the lunch in a small town, we proceed on our trip. During the second half of the trip Mohanji was chatty. 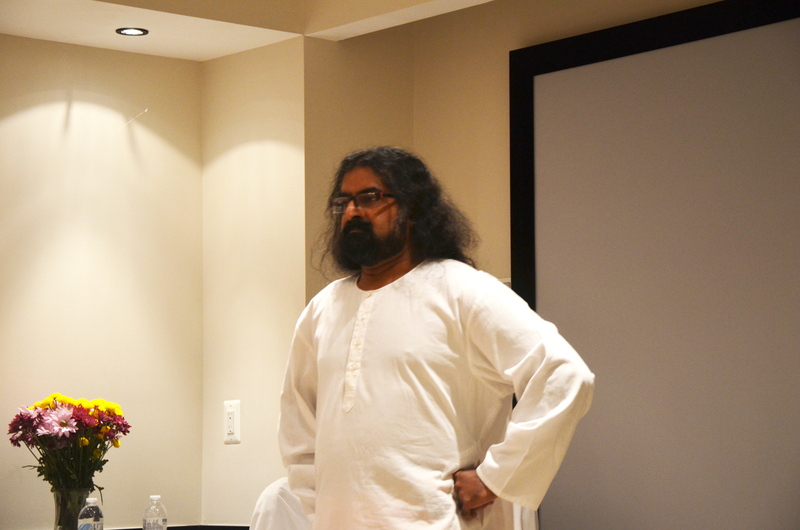 He shared little nuggets of wisdom through anecdotes and references to the Mahabharat. 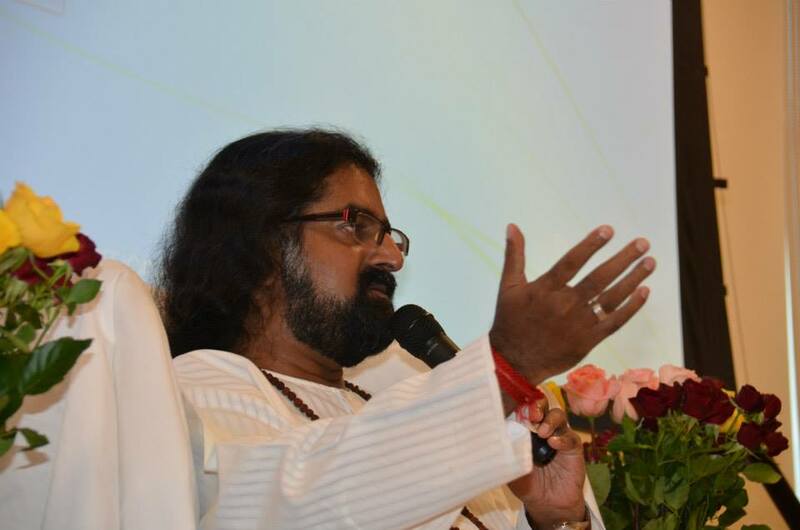 There are many facets of Mohanji, the guide, the father, the spiritual master, the business coach, the life coach….you name it and you will find that in him. Today it was very interesting to see a very chill side of Mohanji. We realized his mind is as wide open as his heart. His views on some subjects that are generally considered as controversial by society are very simple, straightforward and logical. Today we understood the true meaning of unconditional love. Nothing is unacceptable, and there are no judgments passed. He loves you just the way you are. 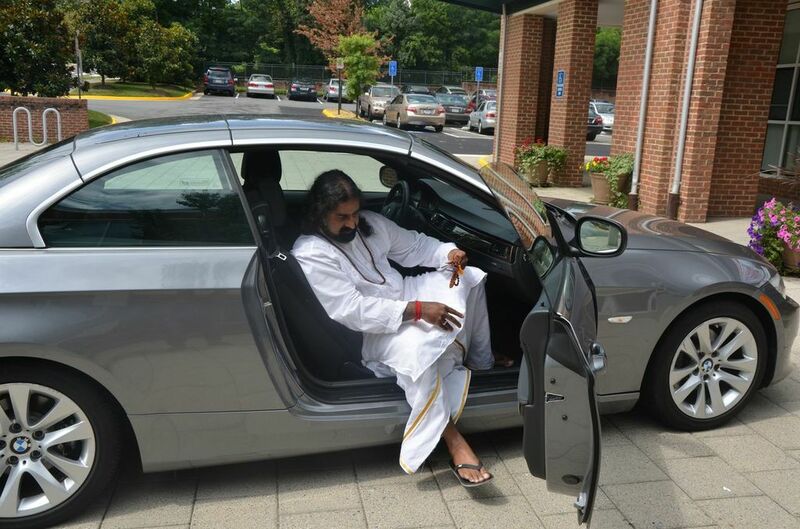 Here’s what we got out of this informal satsang in the car. If you can live with your decision, then be at peace with yourself. Don’t worry about what other people say or think about you. Because in the scheme of things others’ opinion of you does not really matter. 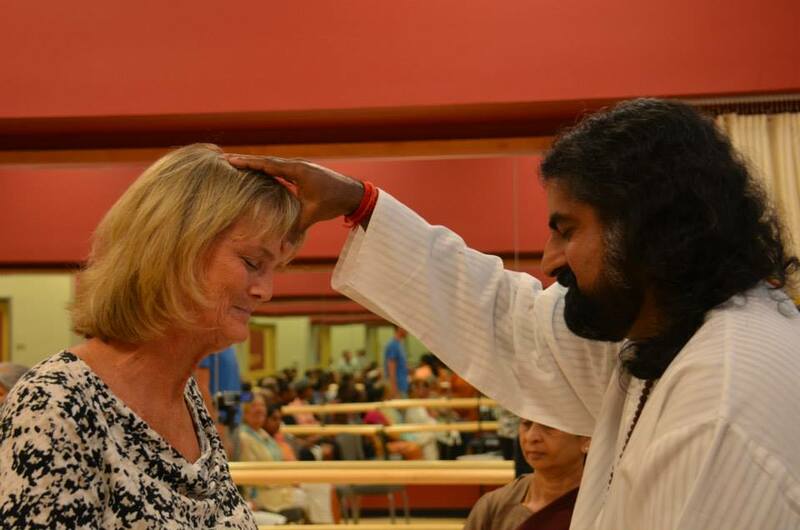 Mohanji’s teachings align with the KISS (Keep It Simple Stupid) principle. Don’t sweat the small stuff, and it’s all small stuff. How empowering is that? Life can be beautiful if we allow it to flow. We reached the sai mandir at 7:30pm. Mohanji was received with full honors as per tradition. Initially there was a small gathering of devotees. But, as it has been the case in every place he has been to, the crowd gathers and people gravitate toward him. 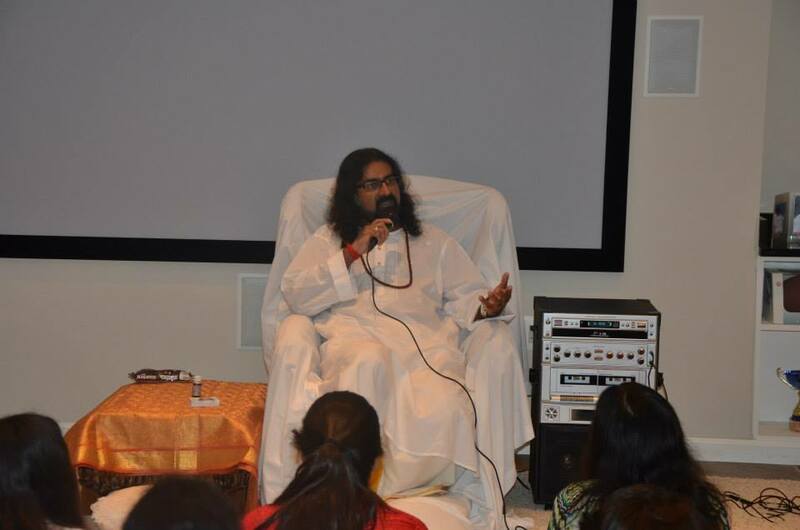 At the end of the satsang there were approximately 150 people who were listening to him with undivided attention. Today was a lucky day for the devotees at the mandir. Mohanji decided to give Shaktipat which was very well received. The youngest recipient was a little baby that was just a few weeks old. It was very interesting to watch people who were hesitant to take his card from us before the satsang started, were coming back to us to get multiple cards so other family members could have them as well. Mohanji was honored by the Malyala family with a shawl and was served a full meal that was offered to Baba. … and was served a full meal that was offered to Baba. Over the weekend I visited Brindavan and Mathura to be one with Bunsi Bhagwaan. Wanted to share an experience with you all. At the Baanke Bihari temple, the crowd had poured in thousands due to the auspicious day of basant panchmi. It seemed a struggle to get through the crowd to get a glimpse of the mohak eyes of Krishna. A bit overwhelmed by the crowd, I sat in the corner of the temple, leaned against a wall, closed my eyes and started praying while waiting for the crowd to settle. I thought to myself that every brick has krishna in it so it was fine to be anywhere in the temple. The whole atmosphere was so colourful, intense and psychedelic. The colours thrown around and the chants of radhe radhe, baanke bihari kee jai, were adding to the energy of the place. It was so mind blowing that I cannot express in words. I almost went to sleep (or trance, not sure) and there was a tap on my shoulder and a middle-aged man, dressed in white, put a garland around my neck, put a basant flower behind my right ear and smeared sandalwood paste on my forehead. I almost felt like Radha! Before I could react or ask him what he was doing, he asked me to come with him. I hesitantly followed him. He pushed through the crowd with such ease and we landed at the door step of the sanctum sanctorum. I could not believe that I was there and was ecstatic. I turned around but that man had vanished. I looked around but could not find him. 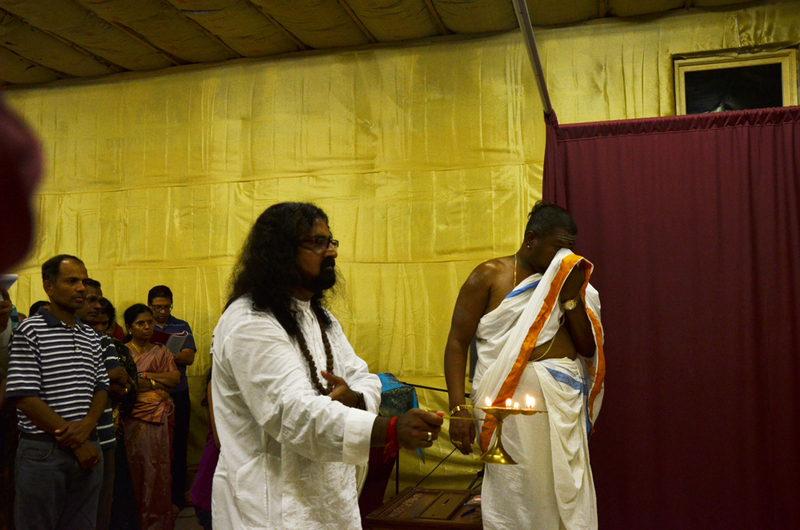 At the same moment, the aarti reached its crescendo and chants got deafening but pleasant to the ears. It was so, so beautiful. That moment can only be felt by your soul and cannot be defined in words. 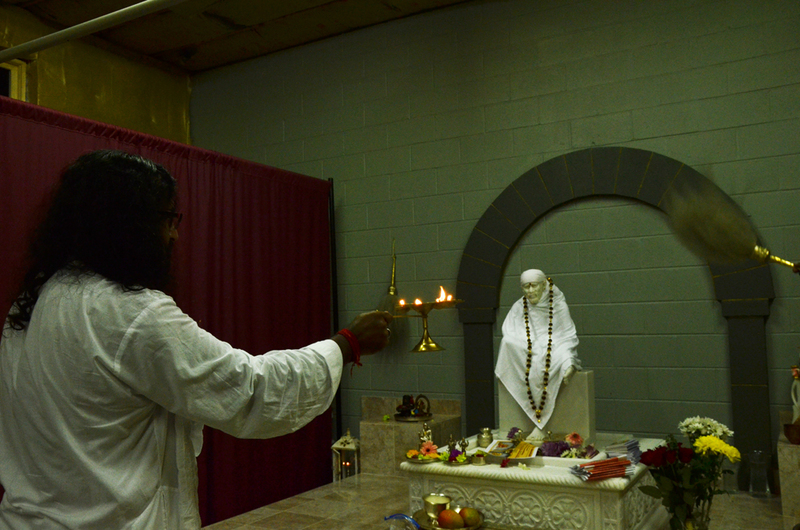 After aarti finished, I went around looking for that person to express my gratitude but he was nowhere. I blessed him from the bottom of my heart for helping a stranger. We know Vrindavan as a place where Krishna – the eternal lover, teacher, protector, friend, guide , the poorna purshotam (the best amongst the best) – spent his childhood. This is the place where love and devotion get a new meaning. In the Brahmanda Purana it is said that all the results of traveling on all the pilgrimages within the three worlds can be achieved simply by touching the holy land of Vrindavan! My last visit to Vrindavan was unforgettable. I had shared my experience in the group when divinity in the form of our master Mohanji had helped me get the divine glimpse of the deity (https://mohanjichronicles.wordpress.com/2013/08/07/radhe-radhe/) . My second visit was no less profound. It just proves that Krishna (also known as MOHAN ) lives there, still. One just has to be open to receive his grace. My father wanted to visit Vrindavan to re-live the moments his father had spent there. My grandfather was a freedom fighter and was based in East Panjab (now called Pakistan). He had moved to Vrindavan in the veil of a monk to escape the clutches of Britishers. He was a staunch Shivaite but in a few months his reason of stay changed. He fell in love with Krishna consciousness and become a devotee. He read Bhagwat and started conduction satsangs on Bhagwat teachings. 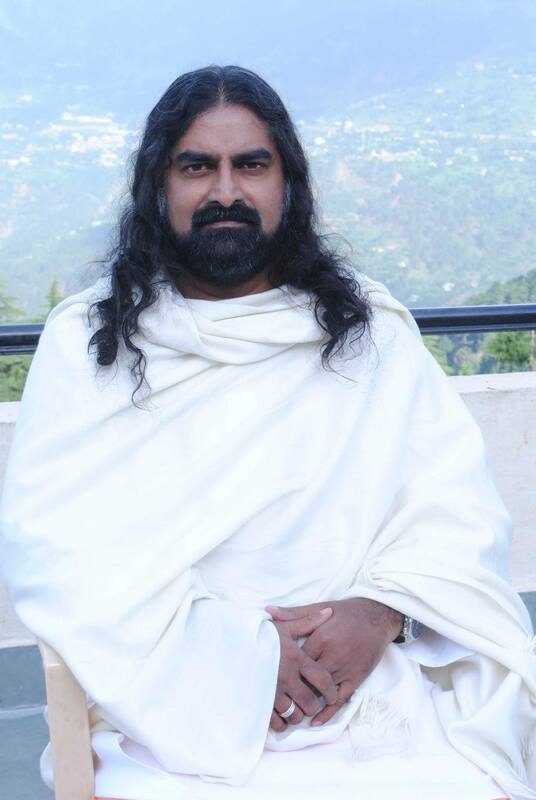 People used to call him “Goswamiji”, or the learned one. My grandfather stayed there for six months but had to return back to fulfill his family duties. But those six months were transformational for him. He yearned to go back, but because of ill-health and political scenario of the country at that time, he could not visit it again. He kept his memories fresh by narrating the stories to my father, who was very young at that time. My father, in spite of being a journalist, never got the opportunity to visit this holy place. This visit was destined now and he was looking forward to re-live the moments. I also wanted to go back to Vrindavan and it was the right time. The month of saawan (autumn) is very auspicious and Banke Bihari ji (the eligible bachelor form of Krishna) comes out of the sanctum sanctorum for the evening aarties for everyone to see and enjoy. This is also the month when the crowd at the town is at the peak. I had a bit of apprehension as I was taking my 81-year-old father and 7-year-old son. Two people who would need individual attention, considering the crowd and atmosphere. I had some hope of help as one of the priests of the temple was known to me. But when I called to check, he was out-of-town. But this did not deter me and I carried on with my plans. I was confident that divine will manage everything. When I reached temple, it had closed for the afternoon and we had a few hours to ourselves before the evening darshan. When I was standing there wondering what to do next, a priest came out of the main temple, held my father’s hand and said, “I have been waiting for you”. I had a flash of thoughts that he could be a thug. But he came out of the door which was meant only for the temple priests. When I enquired, he told me that he was one of the priests at the temple. When I asked whether he knew of our arrival, he said, “sab Banke Bihari ki kripa hai” (all because of Banke Bihariji). I still wanted to be sure of the person, so I called the priest I know and enquired. He did confirm that he is a priest and his name is Ramji. But the question still remained, how did he know that we were coming as no one had told him about our arrival? Accepting the fact that these things happen at such divine places and the “why” has no significance, I carried on. Ramji told us that we had four hours of wait before the temple would open for evening. I wondered what to do till then? How would I manage my old father and child who have totally different needs at any given time? As if Ramji read my mind. He said, “Don’t worry, I will arrange everything and till you are here, you are my guest”. And he added, “You focus on your son, leave your father to me. I am there for him and will take care”. Before I could say something, my father, who usually doesn’t trust strangers so quickly, gave his hand to Ramji and started walking. When I asked him later how he could trust Ramji at the first instant, my father said that there was something in that priest that made him trustworthy. Ramji took us to an eating place and after our refreshment, explained the whole itinerary to us which included Nidhivan, Yamuna ghat, Radha Vallabh Temple, Jai Singh Ghera ashram, etc. These were exactly the same places my grandfather had spoken to my father about! 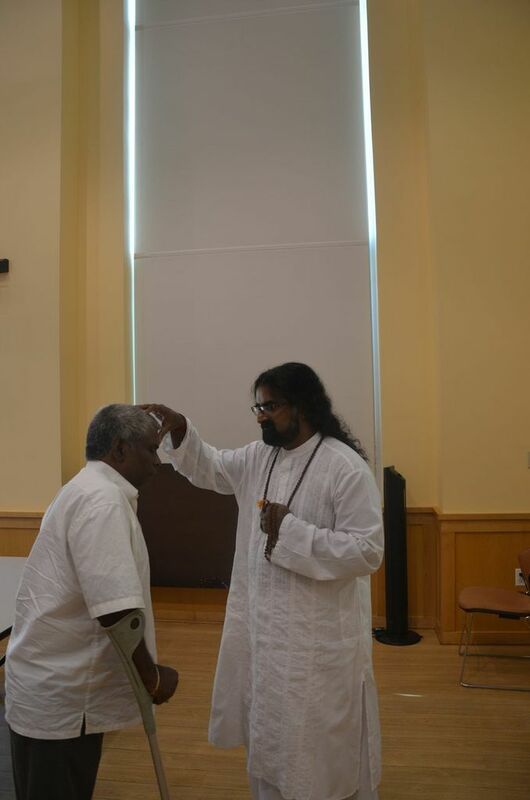 My father was utterly surprised and told Ramji that he was a mind reader! Ramji did not leave my father’s hand, not even for a single moment. He helped him through the crowds, through the narrow lanes, complex stairs etc. My father also never looked back at me for anything. He had totally forgotten that I was also with him . And I got ample time to manage my kid. He took us through all the places with a lot of love and care, explaining the significance of everything to my father. I trudged along trying to catch up. I was happy that my father was enjoying and relishing every moment of it. This was the moment that he has been longing for years. After the tour of the city, it was the time to visit Banke Bihari ji. Ramji asked us to wait in the rest room as he advised us to wait till the crowd disperses. But my father was eager to visit as soon as possible. Ramji agreed and ushered us inside the temple. It was packed and crowd was just growing. My father was overwhelmed and so was my son. But Ramji told us to chant Radhe radhe and keep moving. Everyone in the temple was chanting and they soon reached the crescendo. Ramji helped us wade through the crowd and took us right in front of the idol. It was mesmerizing. From that moment, everything was like a dream, a deep state of trance. Everything was still. Nothing existed. It was only Bankeji and us. We felt that we would have spent hours there, drowned in the hypnotic eyes of Bihariji and in reality we were there only for few seconds. Suddenly we were woken from the dream by a guard who urged us to move forward. Ramji who was now standing next to the idol, asked us to come closer. He applied sandalwood paste on forehead of my father and son. 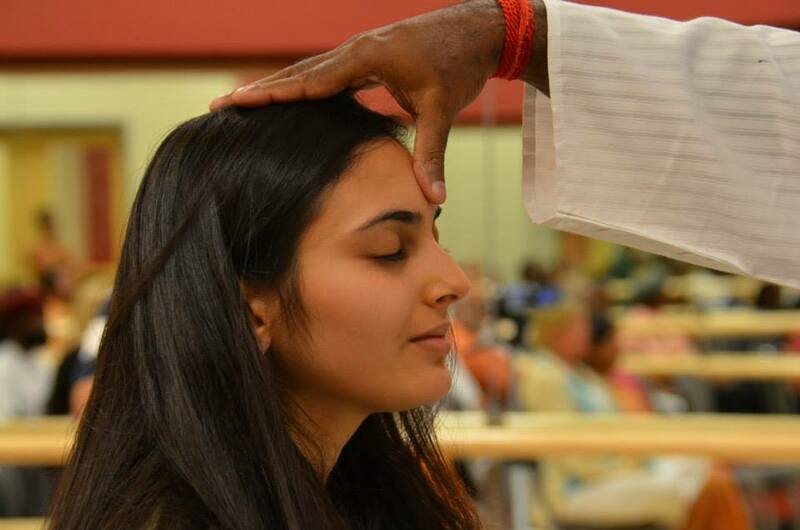 The moment he applied the paste on my forehead and put his thumb on my third eye to apply kumkum, I had I had déjà vu moment, a vivid repeat of the experience that I had the last time. I strongly felt Mohanji’s thumb on my forehead, giving the third eye shaktipat. I closed my eyes and thanked from bottom of my heart. I felt burning sensation on forehead as if my third eye was on fire! The sensation was so strong that I could not open my eyes for a while. I could not decipher what it was. 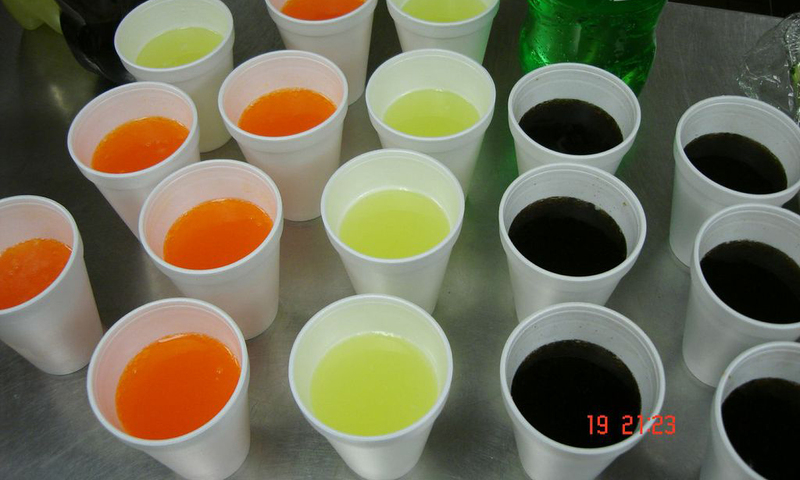 Various thoughts came in mind including allergic reaction to kum-kum! The sensation remained as we walked out the temple. All three of us were quiet. We wanted to be in silence. My son, who is otherwise playful and full of energy, walked quietly with a blissful smile on his face. We did not see Ramji after that. I waited outside the temple for a few minutes for him to come out but I saw he was busy attending to other devotees. I thanked him from my innermost heart and with tears in my eyes bid adieu to him. My father was convinced that he was a messenger of God and his father had sent him. He had a feeling of extreme gratitude. With the burning sensation still on my forehead, we planned to leave Vrindavan. As we walked towards the car park, my son suddenly turned towards me and said that there was something on my forehead. I got worried that there might be something to do with the burning sensation. My son picked up my phone and clicked the picture of my forehead and showed it to me. The moment I saw the picture, understood the burning sensation. The picture is here to see, needs no explanation. The shivalinga and the snake around it is vivid. One can decipher the various images. It is like a stamp. A reminiscent of the Shaktipat I received inside the temple. The moment turned up like the sequel to my earlier visit. The experience of divinity was vivid and real!